A good roadtrip is a thing of beauty. A perfect balance of planned stopping points and freely roaming where the day takes you. 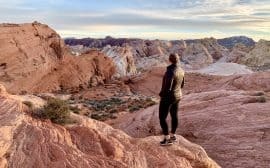 It takes a lot of work to structure an itinerary just right so you have all the time you want to stop and explore, but always get to where you’re supposed to end up. 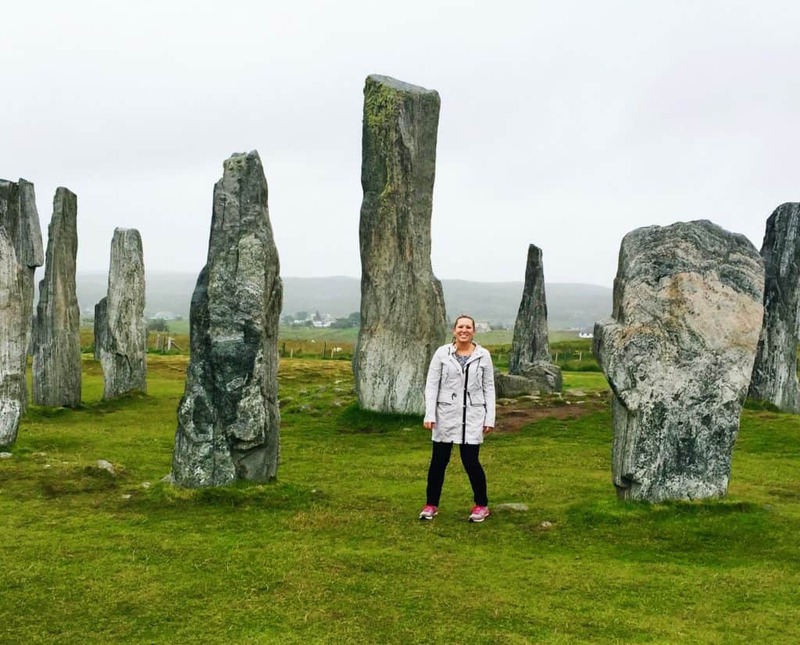 The roadtrip I took over 10 days in Scotland with my parents and grandma was one of the more challenging trips I’ve ever planned. And I’ve found that to be true of most of my epic roadtrips, partly because there are SO many possibilities. It’s different than just going to a city and seeing the key sights. Your options are almost limitless. 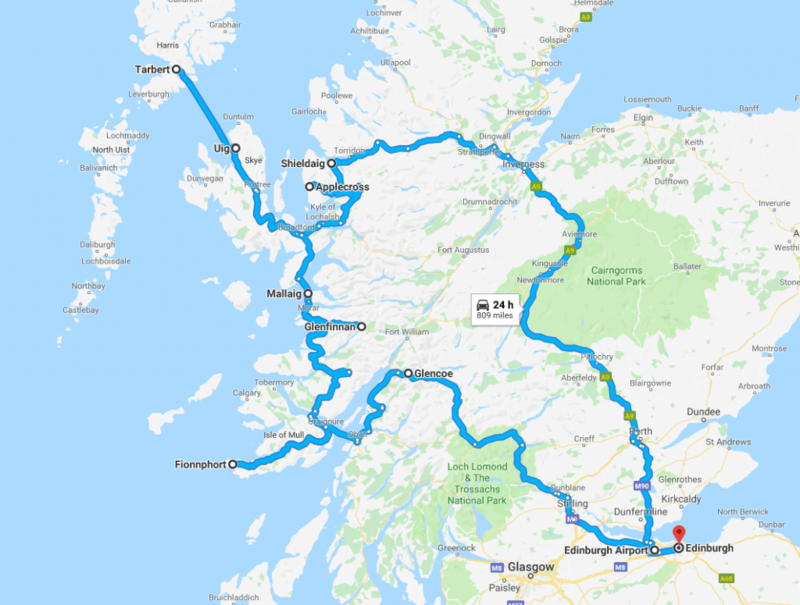 So I’ve put together a super thorough outline of our 10-day Scotland itinerary to help you plan your own roadtrip adventure! 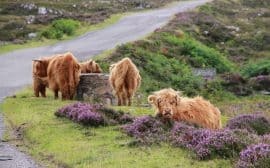 Specifically, we focused on Scotland’s Highlands and islands…while they require a bit more work to get to, you will be rewarded with mind-blowing scenery and a feel for local culture, without fighting any crowds. 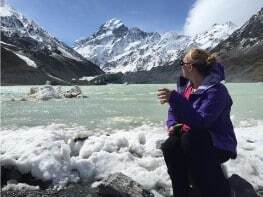 The main tourist season is early spring through early autumn, with the peak season being July and August. Typically that time is going to be the best weather and the biggest crowds (though “biggest” is still somewhat relative in my opinion vs. places like Ireland). And the weather can be rainy and chilly at any time. Make sure you pack layers and things that can dry quickly, as well as a good rain jacket and bag of some sort that can protect your phone or camera. 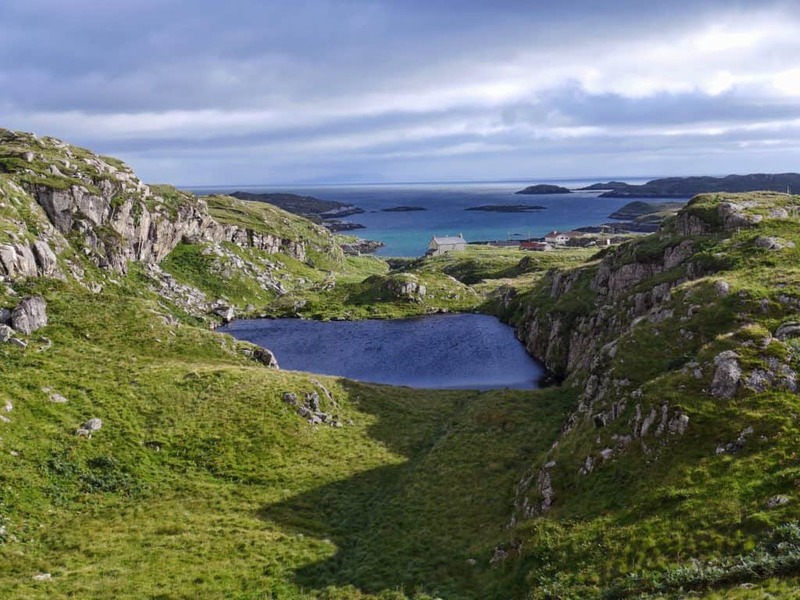 I’m a big Highlands & islands fan, but be aware that during the tourist off-season a lot out there shuts down, and even finding housing can be tough. 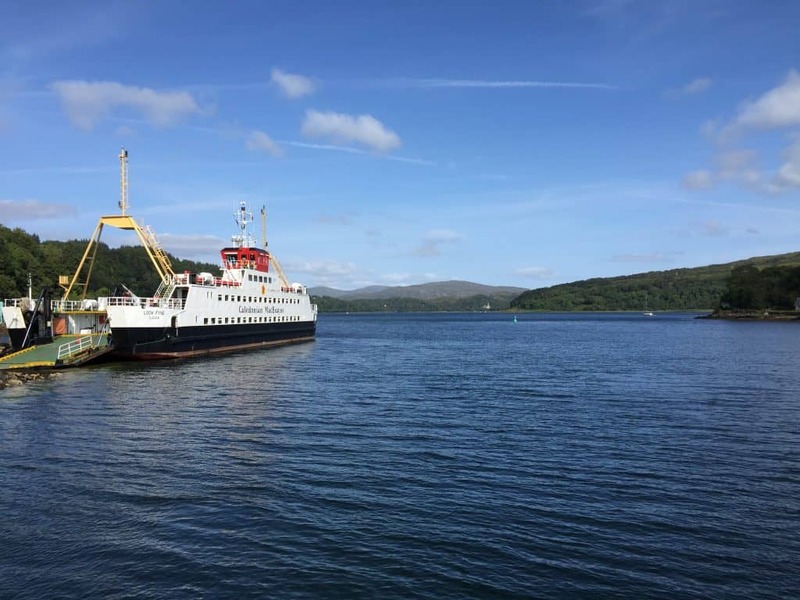 Also, if you’re traveling in the summer, car ferries can be full so you may want to consider booking ahead if it’s important you make a certain time and it’s a more popular route. We didn’t for the most part, and were totally fine. One thing to note: For us, ending in Edinburgh made sense, because we could then drop off our rental car, take a cab into town and be free. We are great hitting the road right away, even off an overnight flight. 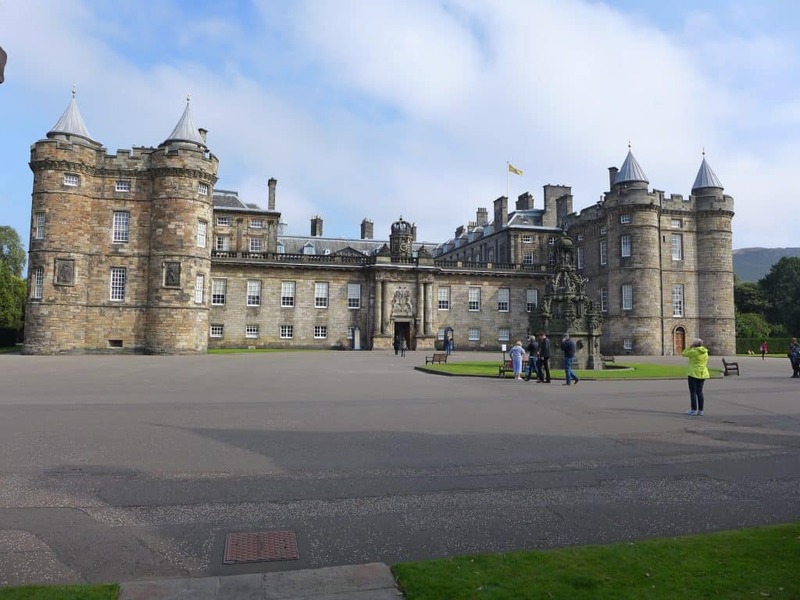 However, many people will be more comfortable beginning in Edinburgh to spend a day getting used to the time difference before driving…you can take a cab back out to the airport to pick up your car if you want (to avoid driving in the city). Here is a rough (not perfect) idea of our driving route over the course of the trip. You can see the map live here as well. Within each day’s section, I’ll mention where we stayed the night. 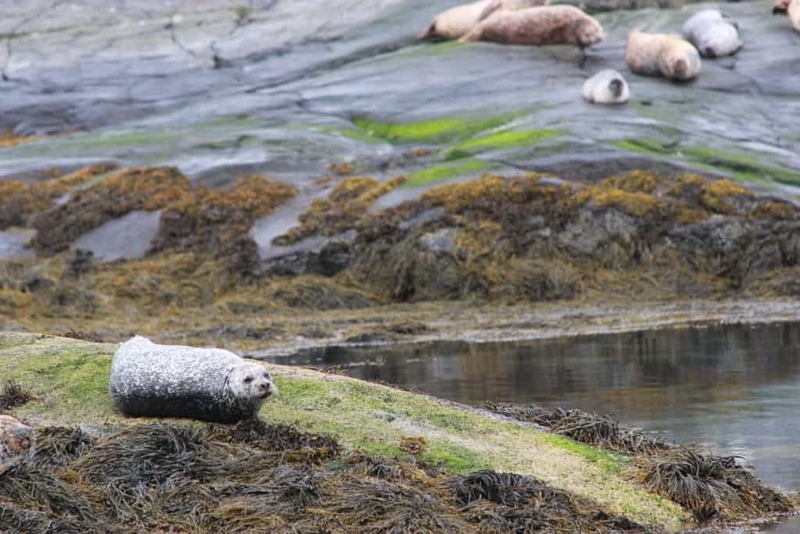 I totally recommend bed and breakfasts in the Highlands and islands, though we had the occasional hotel—and they’re not cheap. 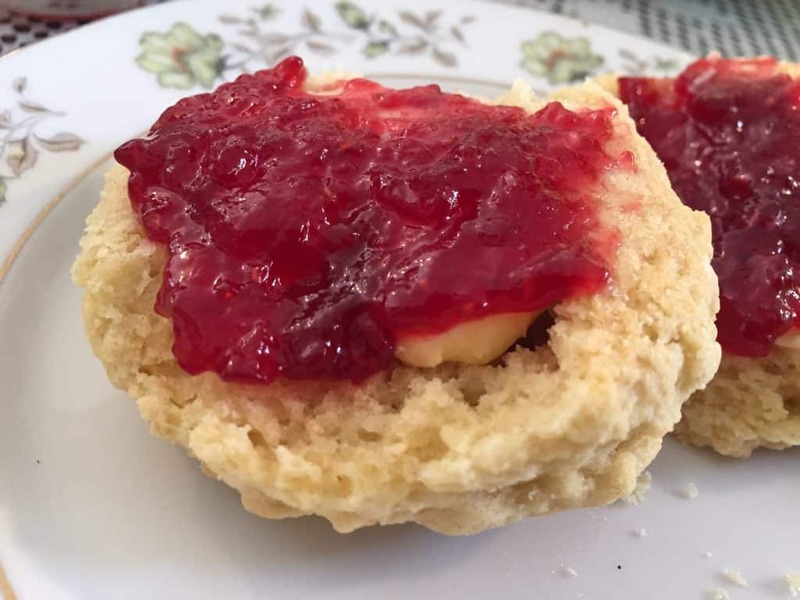 But B&Bs are great because you will typically get to enjoy home-cooked traditional Scottish treats like tea and shortbread, scones, porridge, smoked fish, eggs, and more. 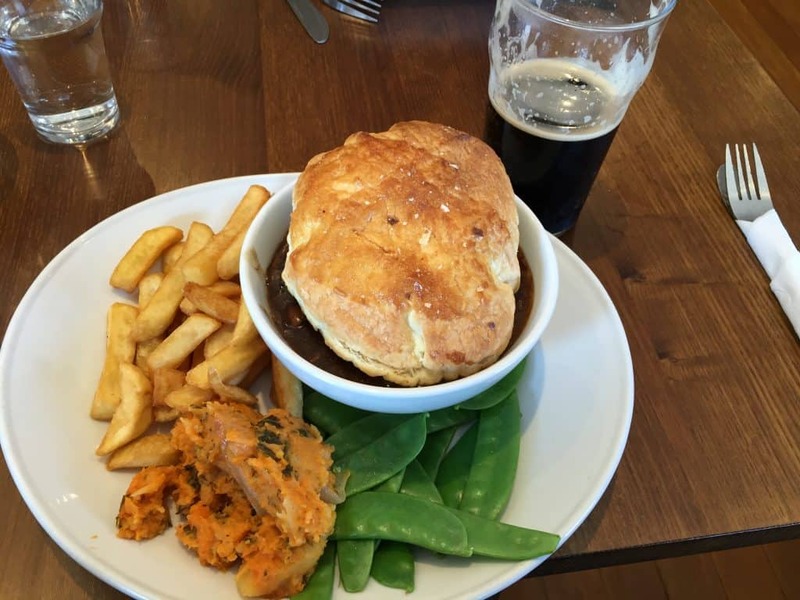 Make sure to try lots of different foods and also enjoy seeing a slice of local life! 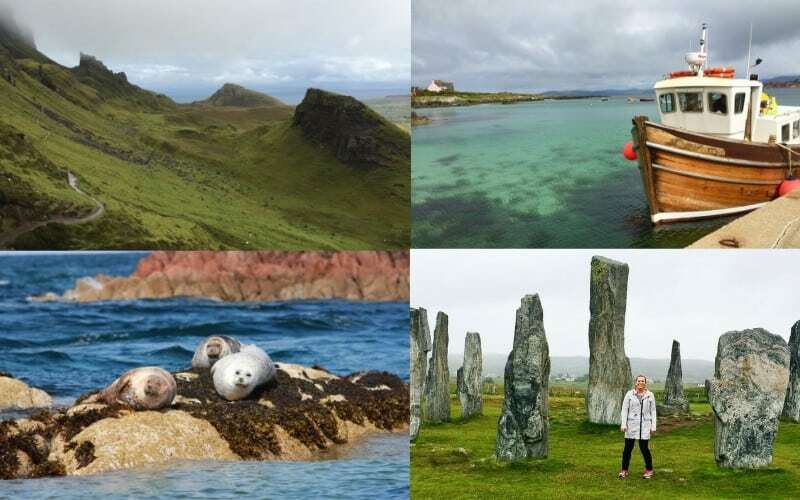 Here are in-depth posts on our entire Scotland road trip! 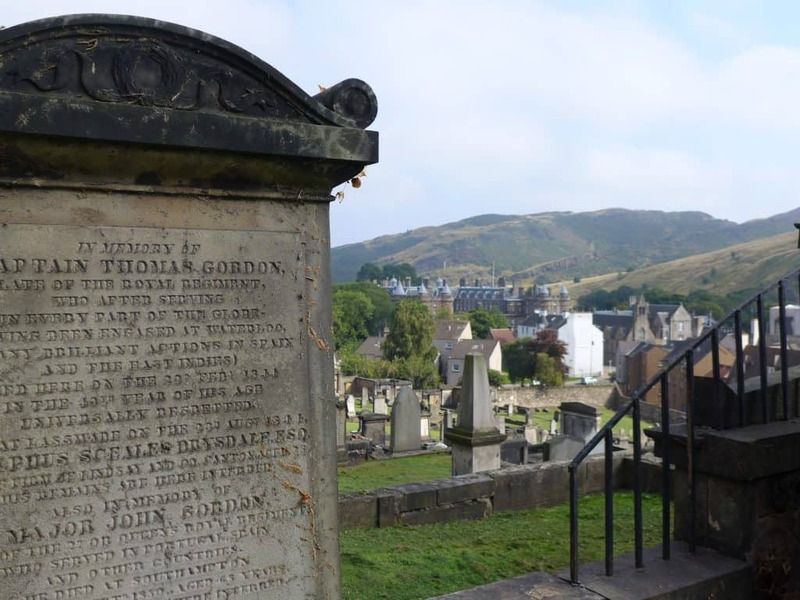 Scotland is technically not a country in its own right, but is part of the UK. It sits to the north of England, connected by a land border, and will be governed by whatever laws England is living by at any point in time. Driving distances: It’s not a very large country (about the size of South Carolina in the U.S.), but don’t be deceived by distances—they will take longer than you think! 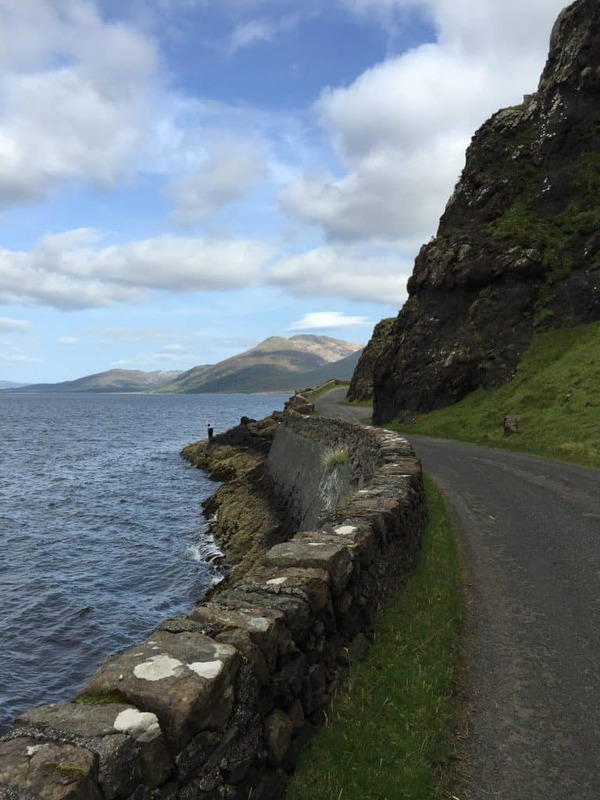 I’ve included detailed info on driving in Scotland at the bottom of this post. In general I found the roads to be much better than in the remote parts of Ireland, however. Currently (March 2019) you don’t need a visa to visit the UK if you’re a U.S. citizen with a passport. However, things are a bit tricky in general for Scotland because of Brexit (the UK severing their partnership in the European Union)…soooooo the best I can tell you is to do some digging and make sure to check your country’s State Department website to understand up-to-date info. 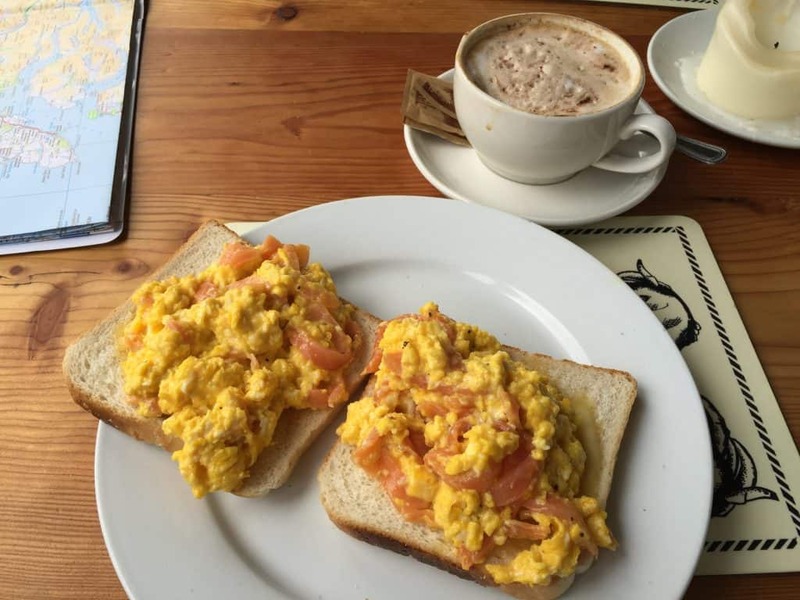 You can pay with a credit card easily in Edinburgh and other bigger towns, but make sure you have cash on you—out in the boonies you’ll definitely need cash (even for B&Bs). And out in the boonies ATMs can go down or run out of money (happened to us on Harris & Lewis), so my best advice is to make sure you have plenty of cash on hand. Also, make sure to get gas frequently! And food, for that matter, if you’re not traveling in peak season. 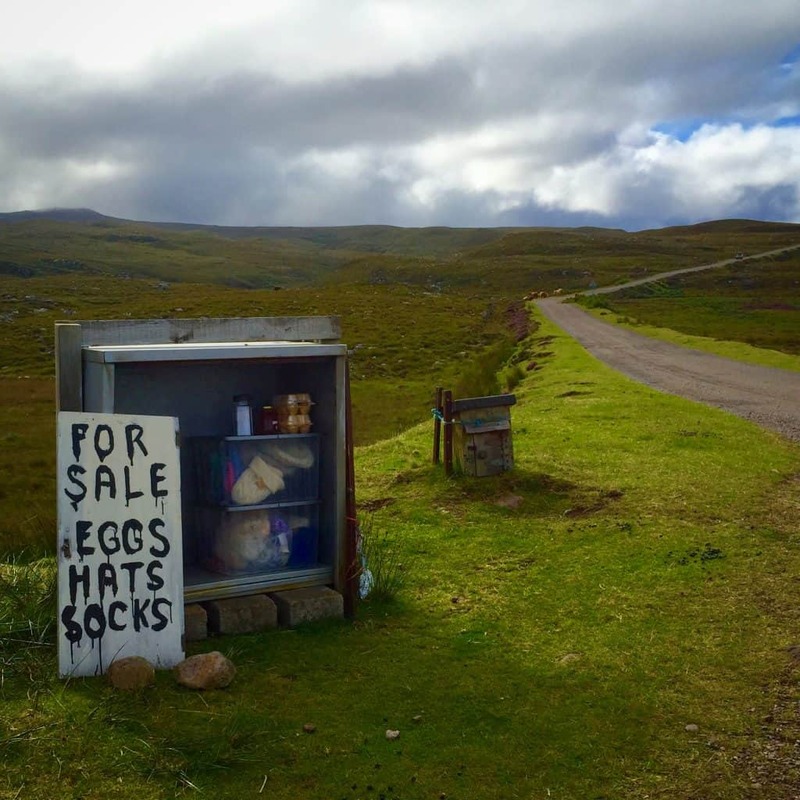 Neither is a sure bet out in remote areas, so take it where you can get it. 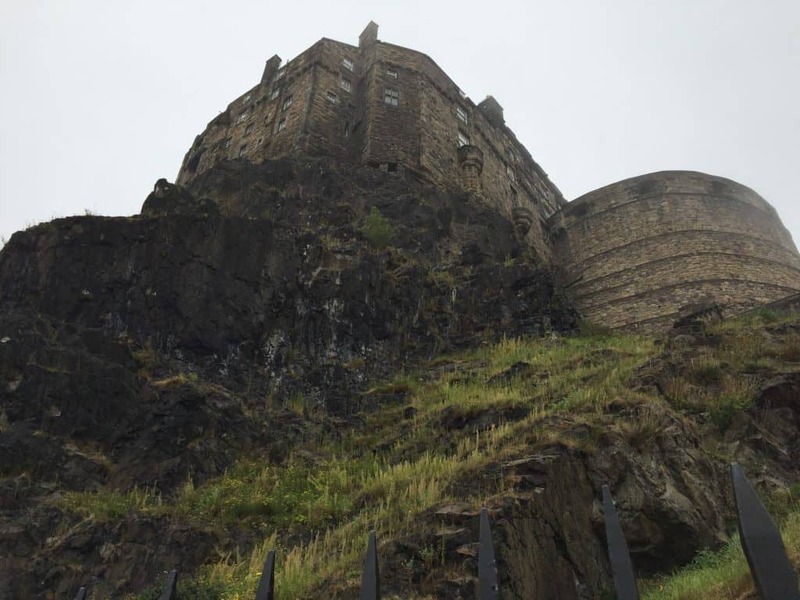 We got our rental car at the Edinburgh upon arrival and hit the road immediately. 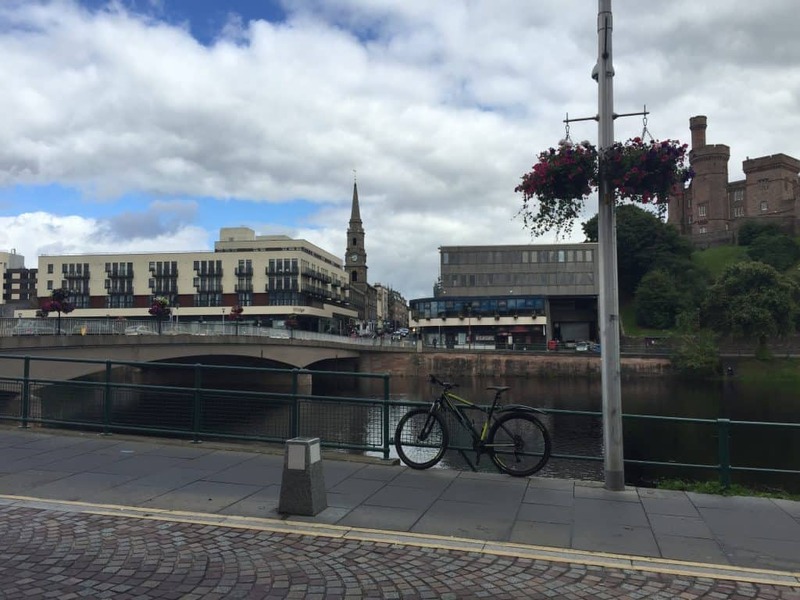 After a coffee and pastry stop, it was smooth sailing and we got into Inverness a few hours later for a late lunch. We only spent an hour or so in Inverness, but it was so cute! Read more about our first day here! 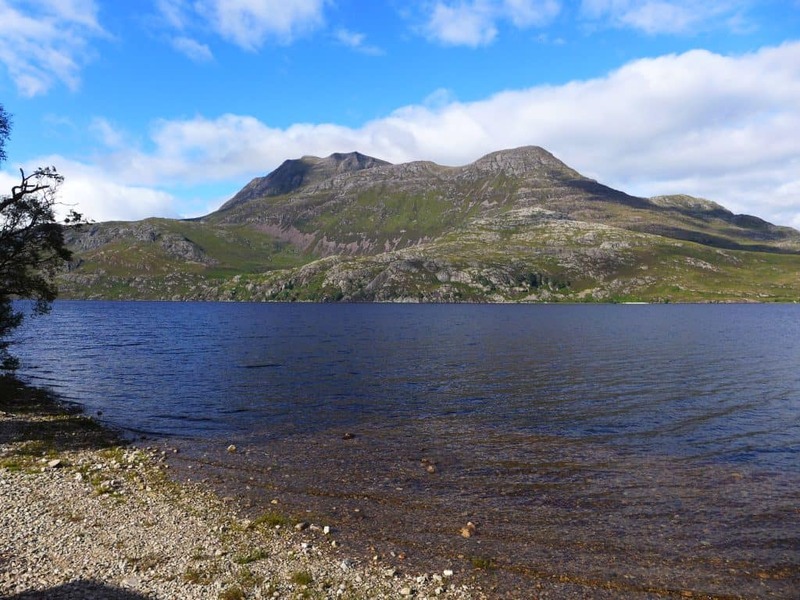 Our destination for the day was the Glen Torridon area, but we made a quick detour to the lovely Loch Maree. It was a perfect place to get out of the car for a bit and stretch our legs. This afternoon’s drive was very much about the journey, not the destination. 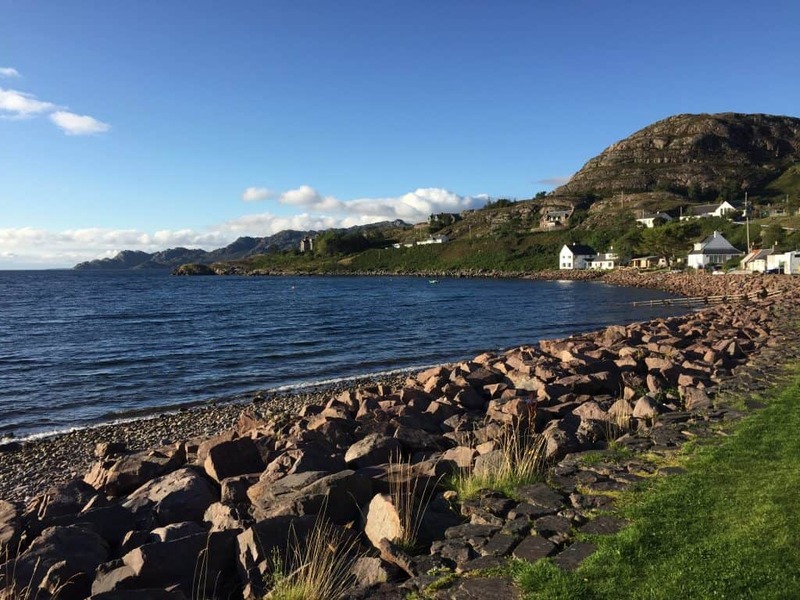 We wound through various quiet roads and towering hills, before coming into Shieldaig for the night. We’d booked a B&B, but the owner had to go out of town unexpectedly so her friend had us at her house instead…which was honestly kind of weird, but I think it really speaks to the feel of community out here in the more remote areas. Lovely, really. 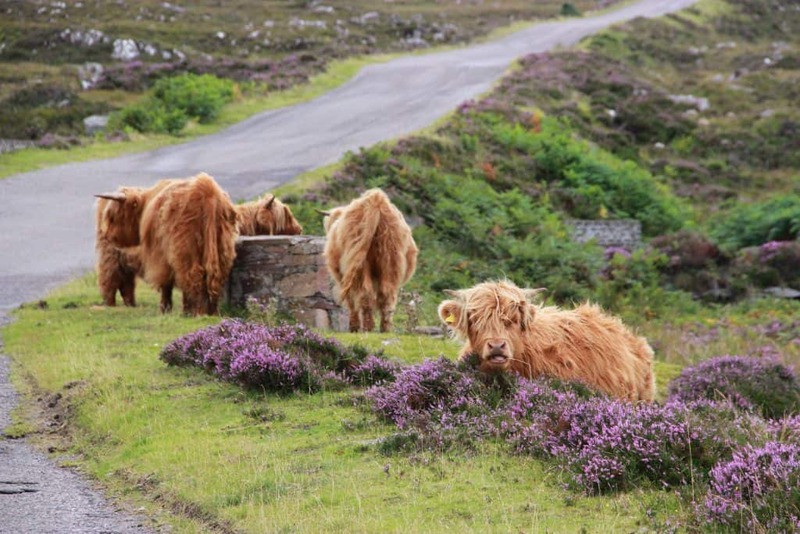 The next morning we headed toward Applecross, enjoying our run-ins with these shaggy Highland cows. I mean, look at that face!! 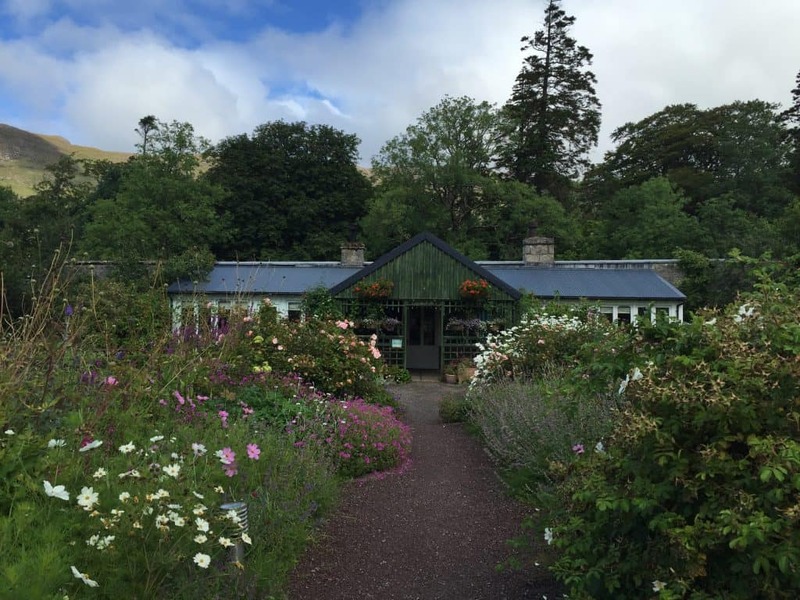 The drive was largely beautiful for the morning, including a lovely stop at a cute place called The Potting Shed (and now The Walled Garden)…it’s like a magical fairy garden, and the food was delicious!!! 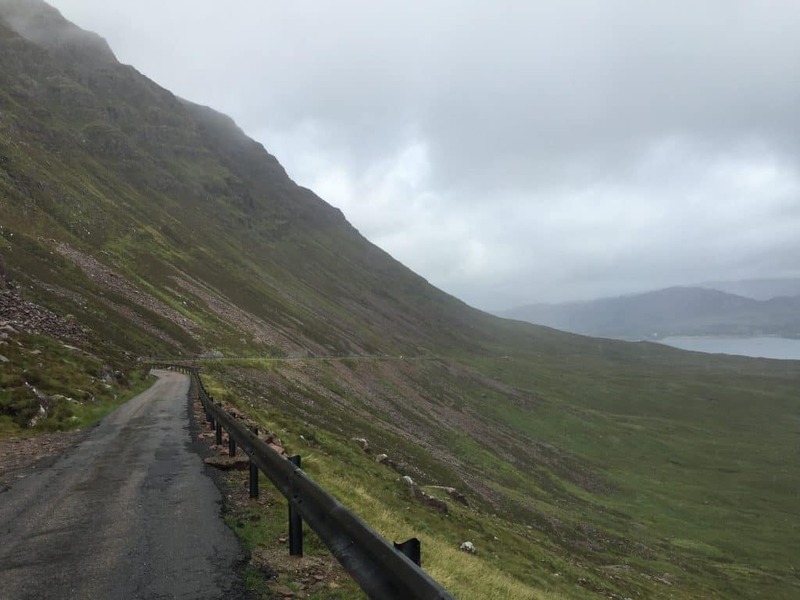 We drove the famous Bealach na Ba (meaning “pass of the cattle”), full of steep switchbacks and hairpin curves. It’s not for the faint of heart, but we navigated it very well despite kind of crummy weather. Thankfully not rain (I think we would have turned back), but fog was sadly rolling in, and by the time we got to the summit it was pure pea soup. The drive itself was gorgeous though! 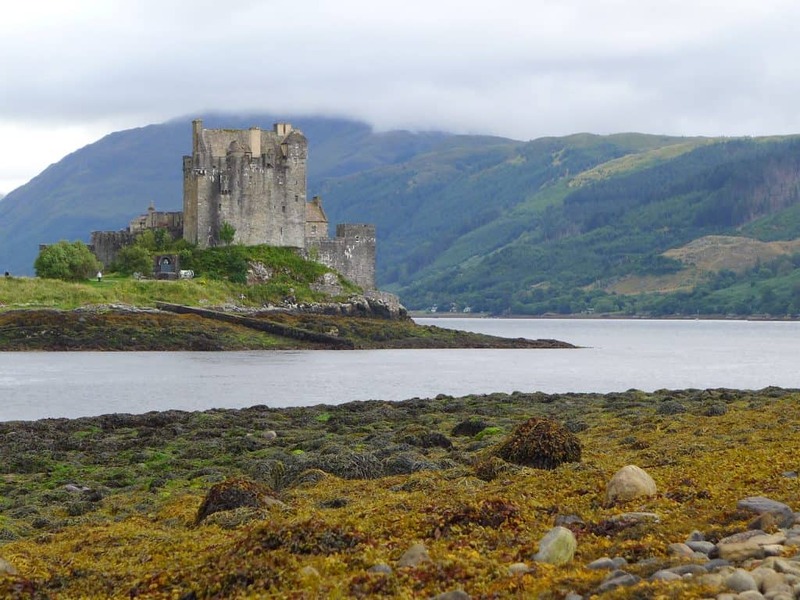 From there it was on to the Isle of Skye, with a brief stop at the famous Eilean Donan Castle. The tide was out and so it didn’t look quite as Pinterest-y as I’d have liked, but it was still super cool! 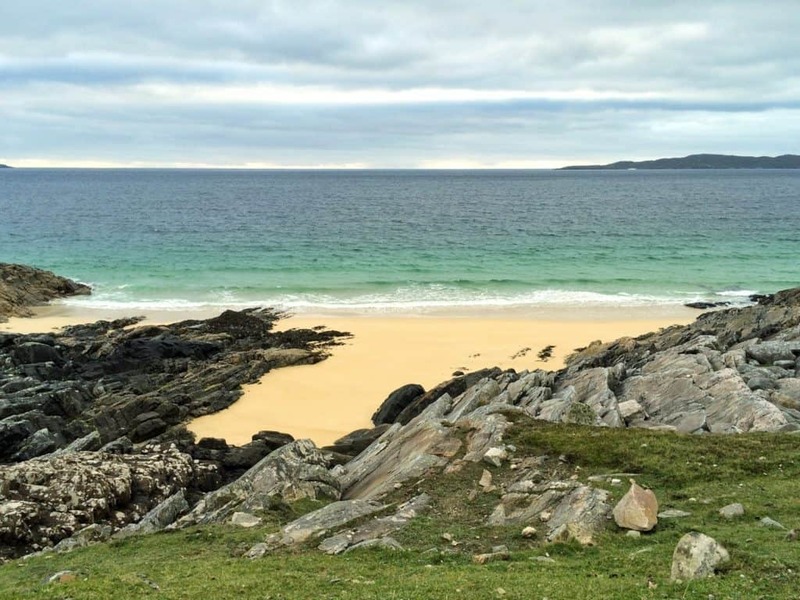 We based ourselves up on the Waternish peninsula for this leg of our journey, as it was pretty central and made it easy to get to all the places we wanted. 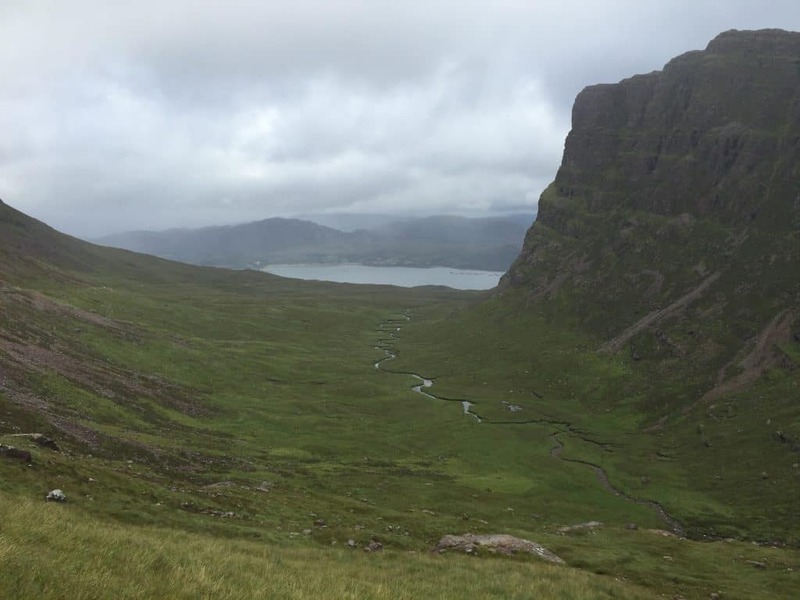 Read more about driving Bealach na Ba & visiting Applecross here! 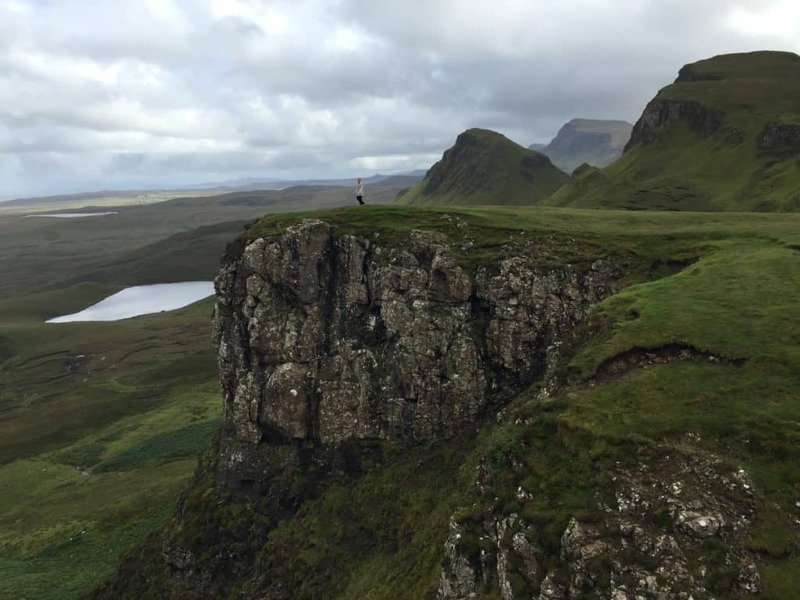 There were so many things I wanted to see and do on Skye that there was no way we could do them all. But ultimately, the itinerary we ended up with really nice mix of the iconic Skye sights, complemented by a few more under-the-radar ones. 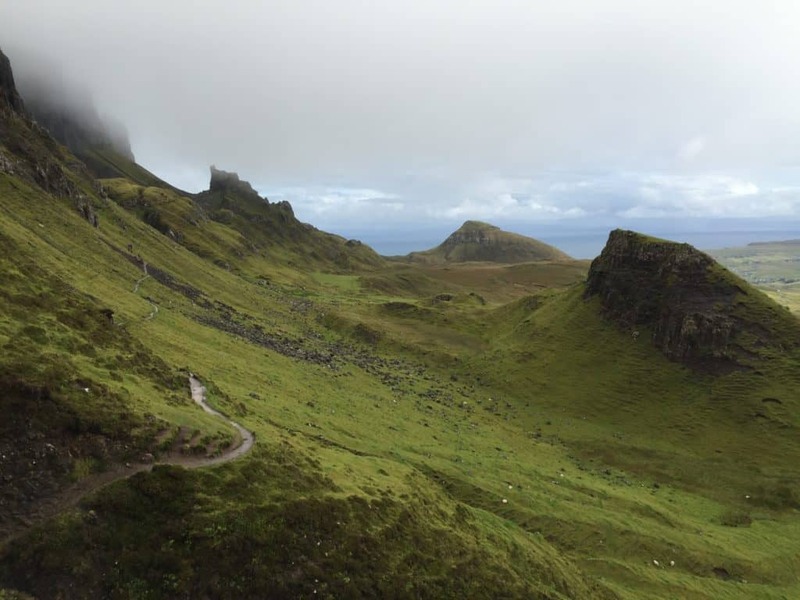 Of all of Scotland’s islands, Skye is probably the most easily accessible—it’s pretty easy to get to, fairly big and diverse, and so has more B&Bs, restaurants, and other tourist infrastructure. 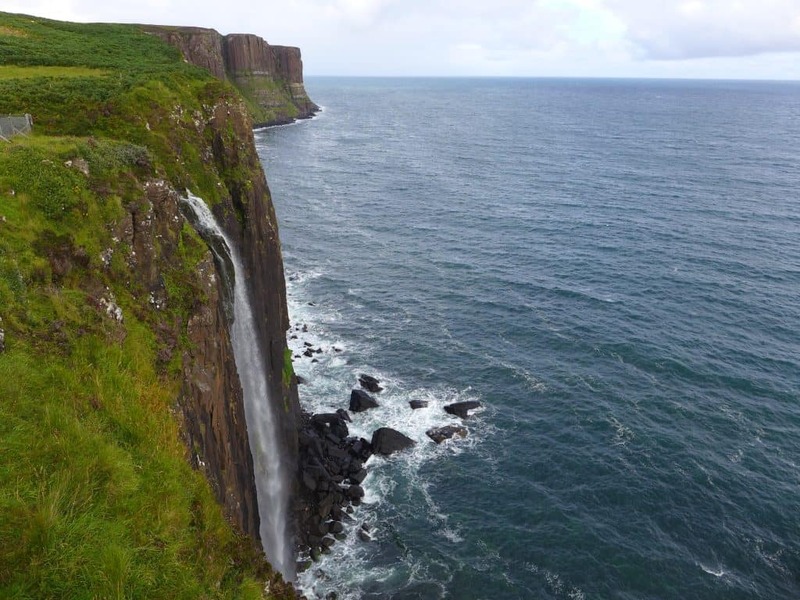 Skye also has absolutely amazing natural beauty, from dramatic cliffs to moody dark lakes to sea cliff waterfalls to fascinating rock formations. 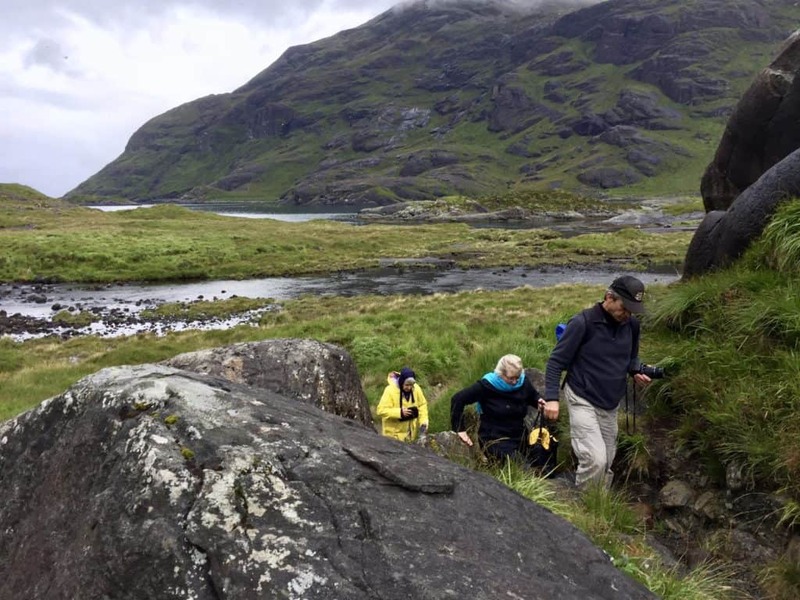 The best parts of Skye require you to put some work in, though—particularly hiking. 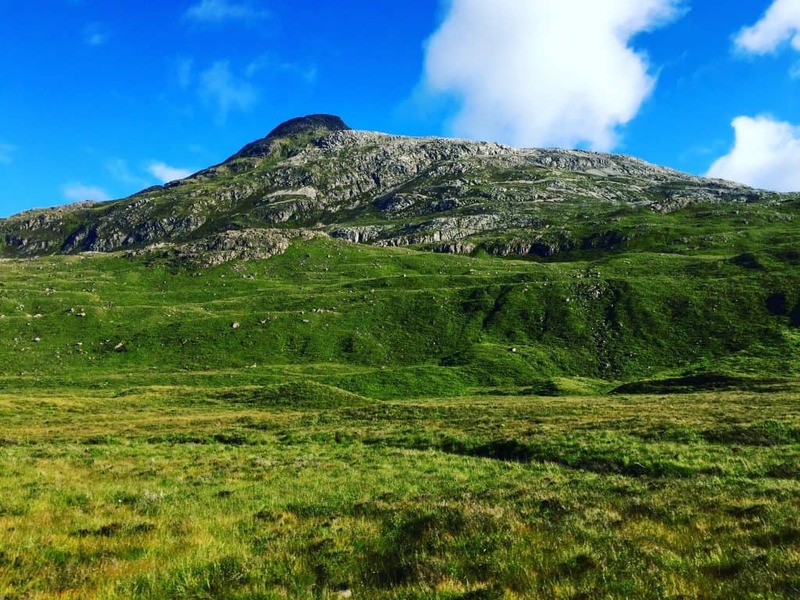 Read more about our two days on gorgeous Skye here! 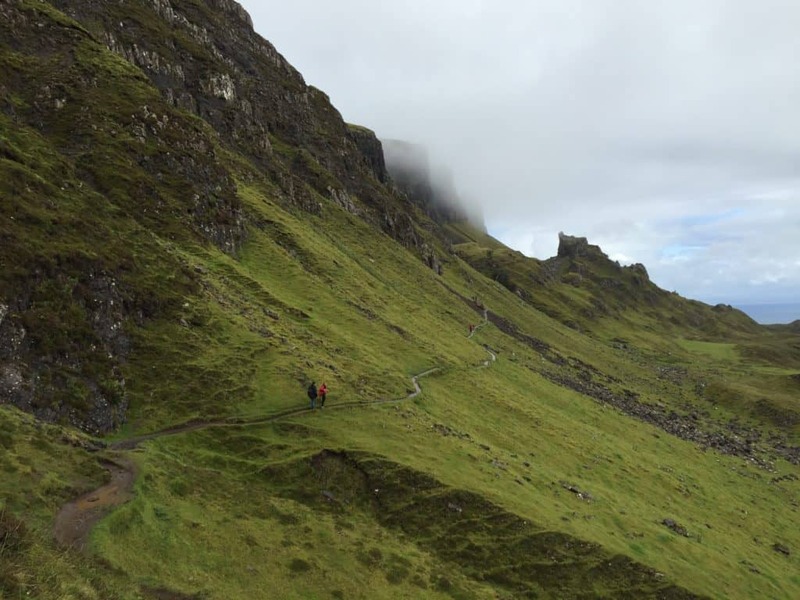 If you’re up for that hiking, then head first to the Old Man of Storr, probably the most famous hike on Skye—indeed, perhaps in Scotland. Sadly the fog rolled in right as we arrived, and there was zero visibility. After walking up just a bit, we gave up and hit the road again. We next enjoyed a stop at the beautiful Kilt Rock and Mealt Falls, kind of jostling the crowds aside to get a beautiful pic. It’s a quick stop but a must! 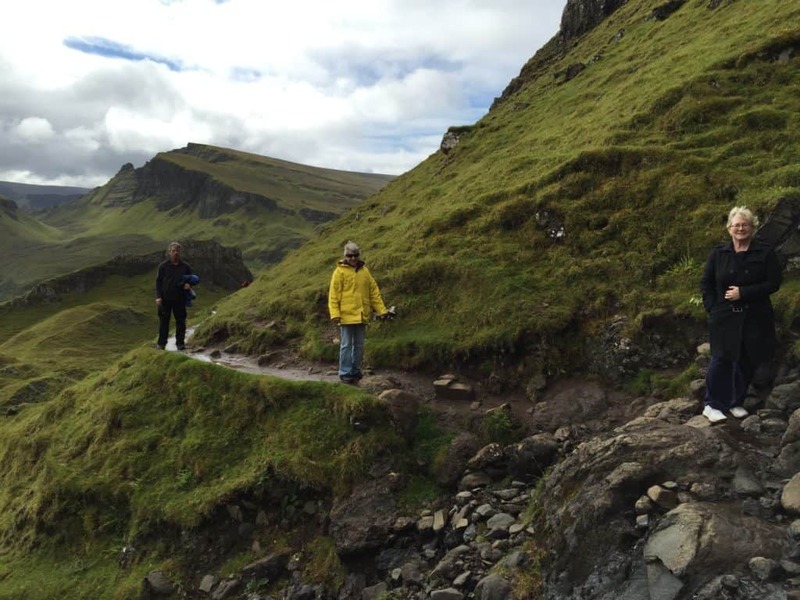 Then gear up for another amazing hike—the Quiraing. Or what I dubbed “Mud and Mayhem”. 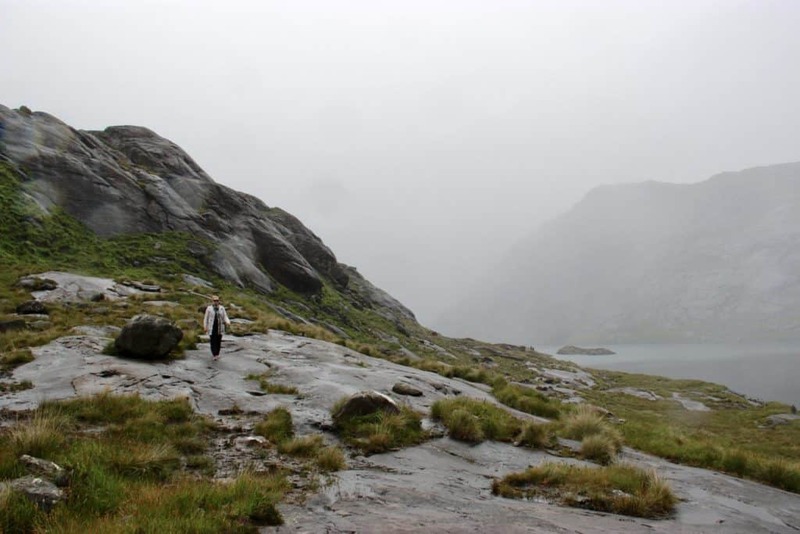 The hike is stunning and majestic and intense and moody, and the views are 100% worth it. 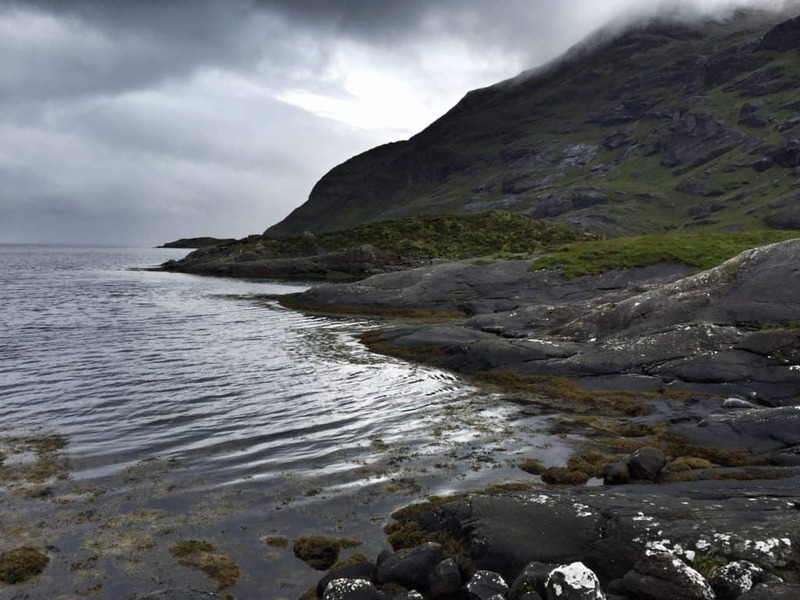 But, like much of the Highlands and islands of Scotland, the weather is…also moody. The trails were super muddy and the weather couldn’t make up its mind. We didn’t actually finish the hike (and I think we may have gotten lost somehow), but it was mind-blowingly beautiful and one of my favorite things of the trip. 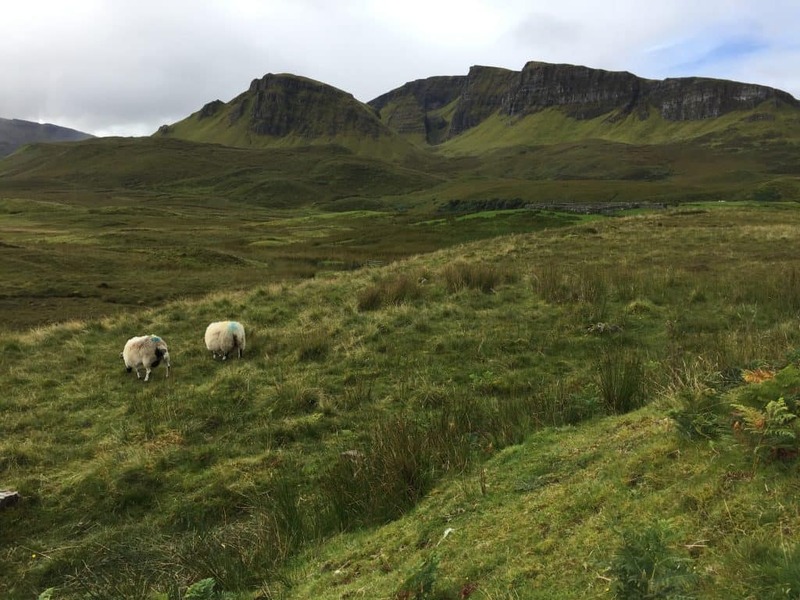 The pics below are just a tiny taste to whet your appetite, but you can see the whole shebang, find out how to visit, and read more about hiking the Quiraing here! Finally, get out to Neist Point Lighthouse for sunset (or, as we called it when we were there, foggy windy rainy twilight where little goats constantly photobombed you…). We stayed two nights at Hillside B&B in Kyleakin (or Stein, the lines are all fuzzy). 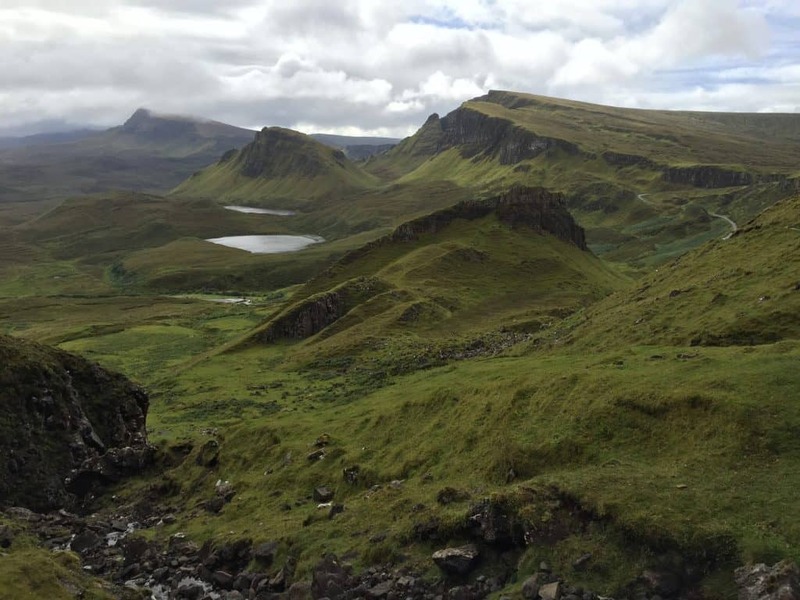 It was a good location for exploring the Trotternish Ridge and Waternish Peninsula, clean and comfortable. Great view too. This was a bit less warm and B&B feeling though, more of a place to stay, and to be fair we weren’t there a ton. 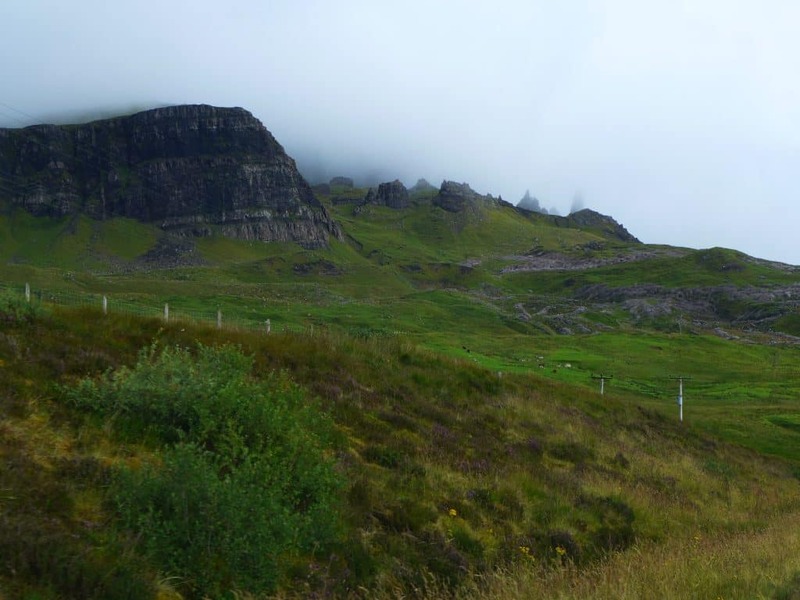 There were several things on the Isle of Skye that we didn’t get a chance to experience due to time and weather, and you can read more about them in my full post on Skye! 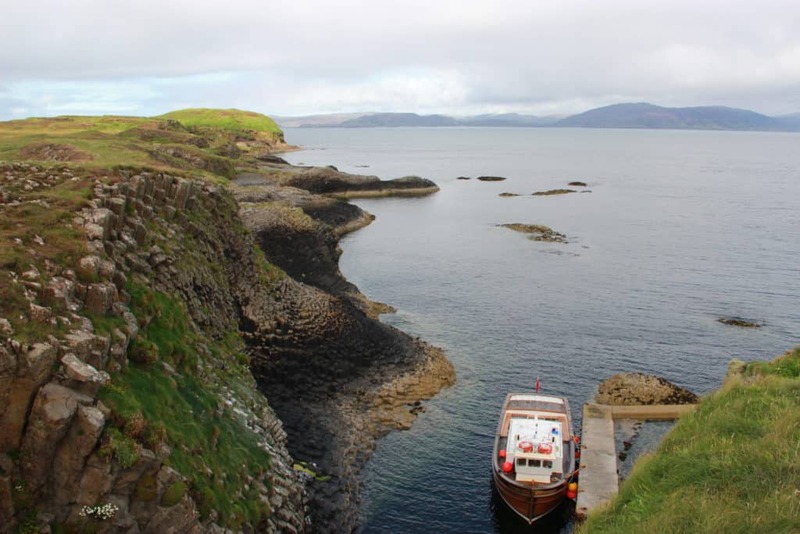 This is one of those places (like Staffa below) that truly feels magic when you’re there. It was also one of the more “out there” places we visited, requiring an almost 3-hour ferry ride from the northern tip of Skye to get there. But boy, is it worth it!! 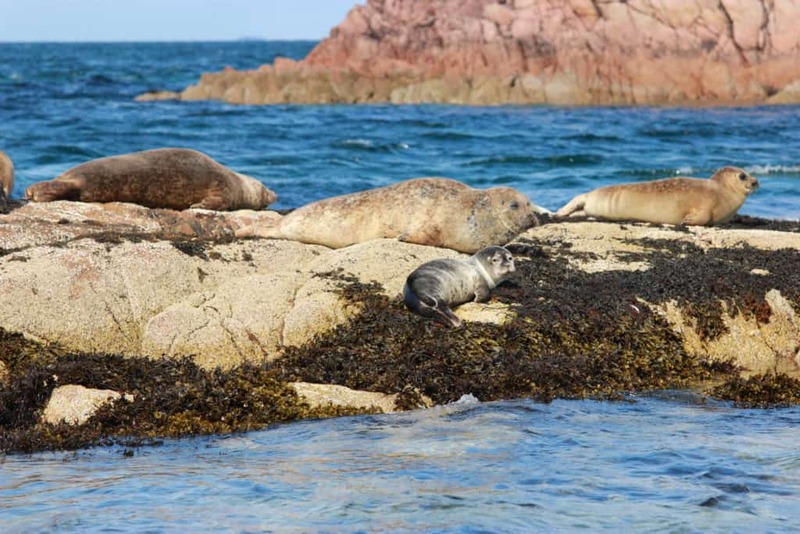 The long two-in-one island (the biggest in Scotland) boasts mystical standing stones, chilly beaches that look tropical, archaeological sites, and amazing wildlife. 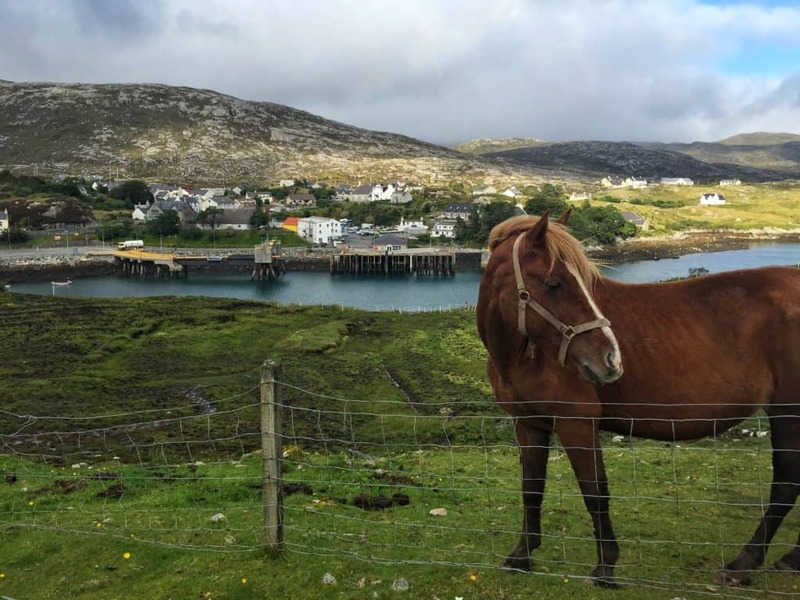 Read all about visiting the mystical Isle of Harris & Lewis here! 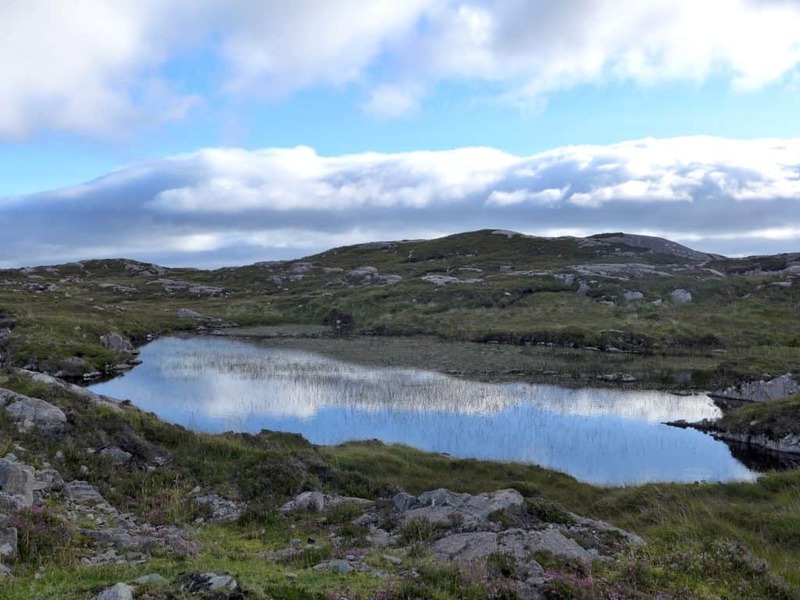 We stayed in Tarbert, the main town on Harris. It’s adorable and super walkable, and then we hit the road to drive around the island as soon as we could. 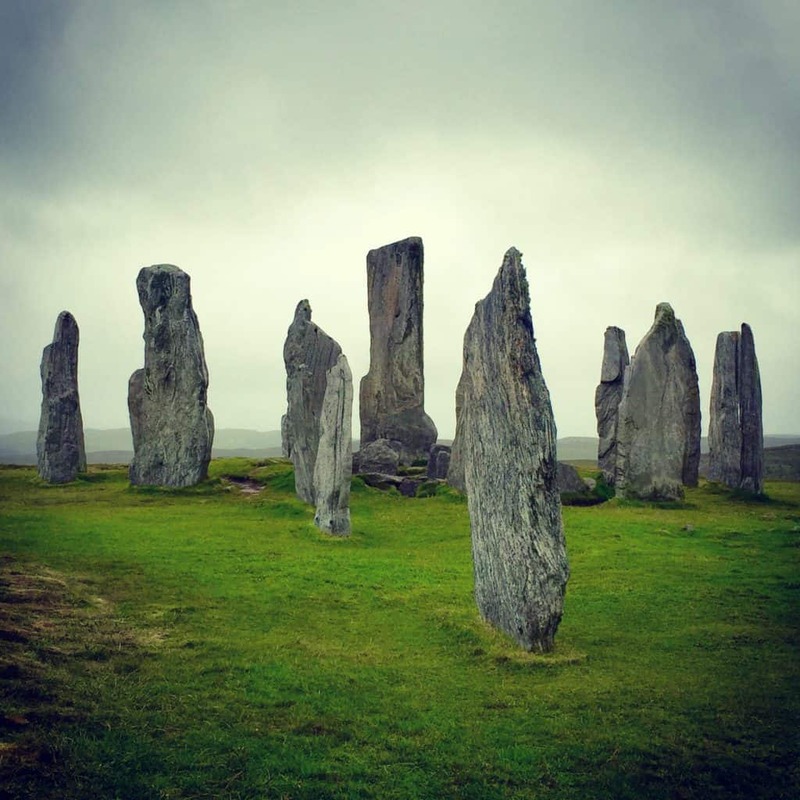 The Callanish standing stones are one of the big draws on the island, and one of the biggest standing stones in Scotland. They’re over 5,000 years old, older than Stonehenge! We continued along the famous Golden Road, seeing old churches, sweeping coastal views, glassy lakes, and more. 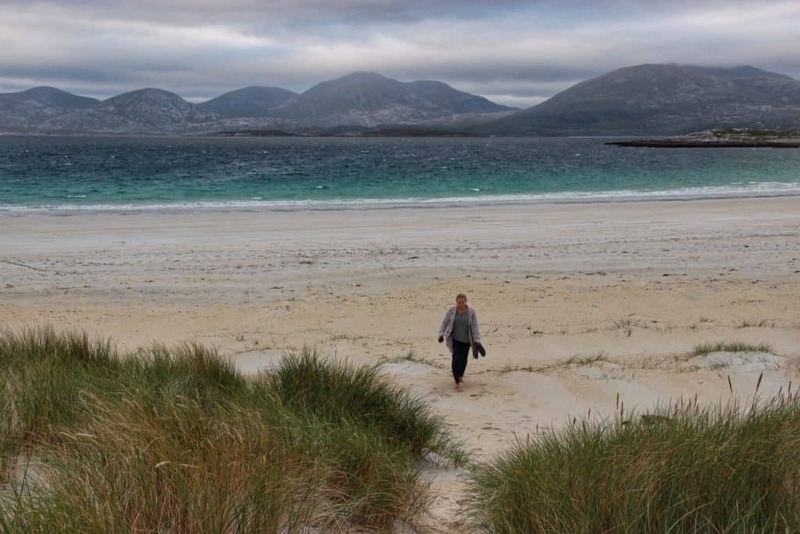 The weather wasn’t really in our favor to see the faux Caribbean sparkling water and white sand that makes the beaches here famous, including Luskentyre (the second pic below). But they were beautiful and moody nonetheless. 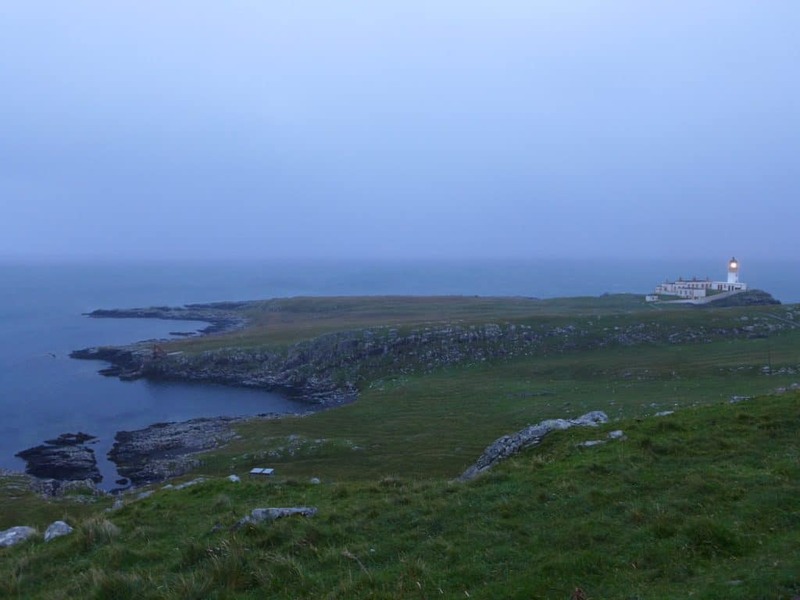 We stayed at the Hotel Hebrides, which was lovely. It was 180 pounds per night for a 4-person family room, which was about $280 USD at the time. We were up bright and early for the ferry back to Skye the next morning, and then drove all the way down to Elgol for a fairly “off the beaten path” boat trip. 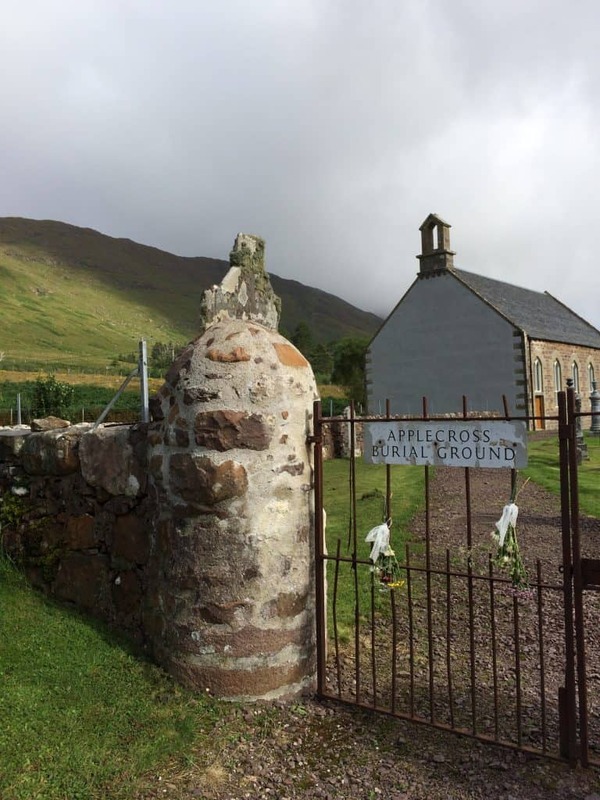 While most of Skye is pretty well-known, this corner of the island isn’t nearly as frequented by tourists. We boarded the Heather Grace an headed toward remote Loch Coruisk, backed by the majestic Black Cuillin mountains. 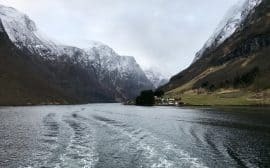 Once we docked, we had a short hike over to the lake, where we walked around and saw some cool wildlife (including a red deer), and generally got EATEN ALIVE BY MIDGES. Mostly it was about soaking up the atmosphere. 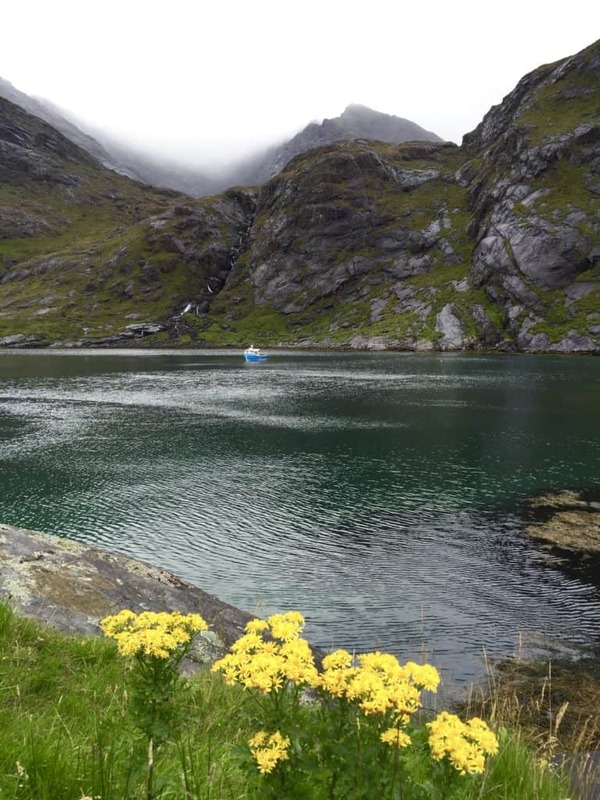 Read more about our Loch Coruisk boat trip here! The gray skies and fog added to the overall moodiness of the entire trip. The inky blue water and rich moss-covered cliffs rising around us, wreathed by fog, were so cool. 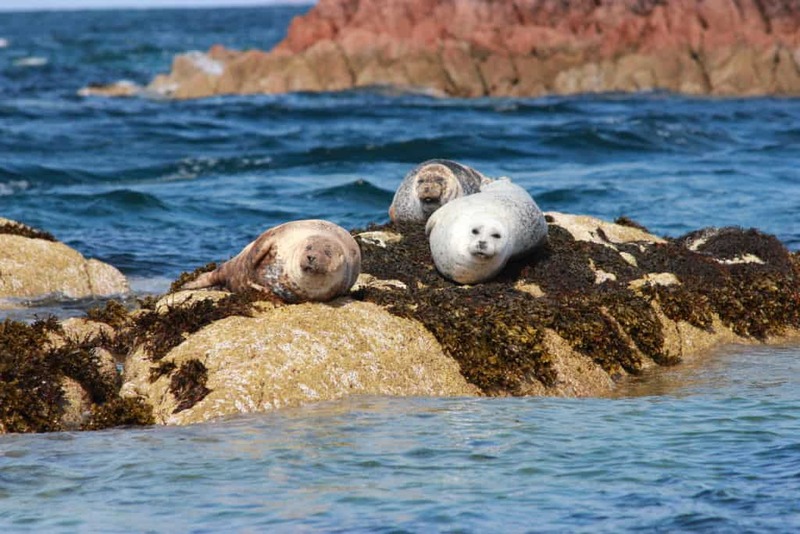 AND THEN THERE WERE THE SEALS!!! 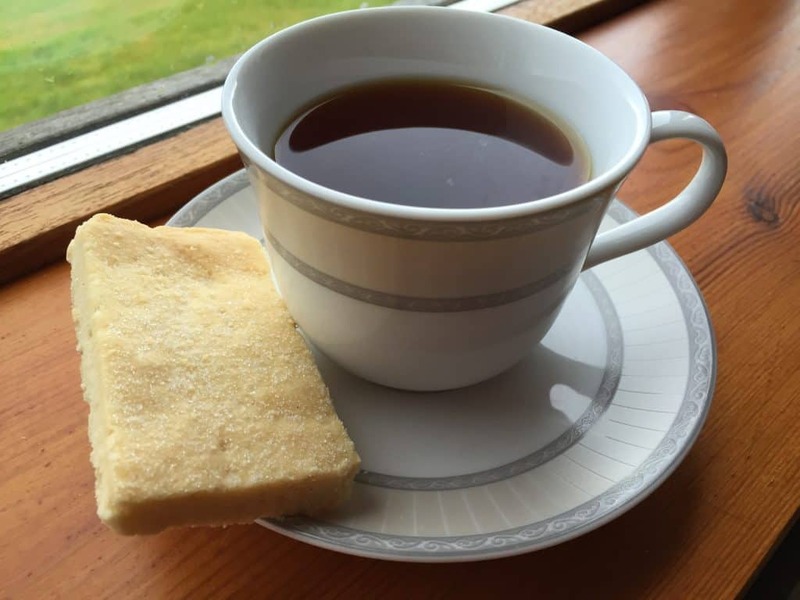 Once back on land, we were happy to warm up with some tea and homemade shortbread at our B&B! 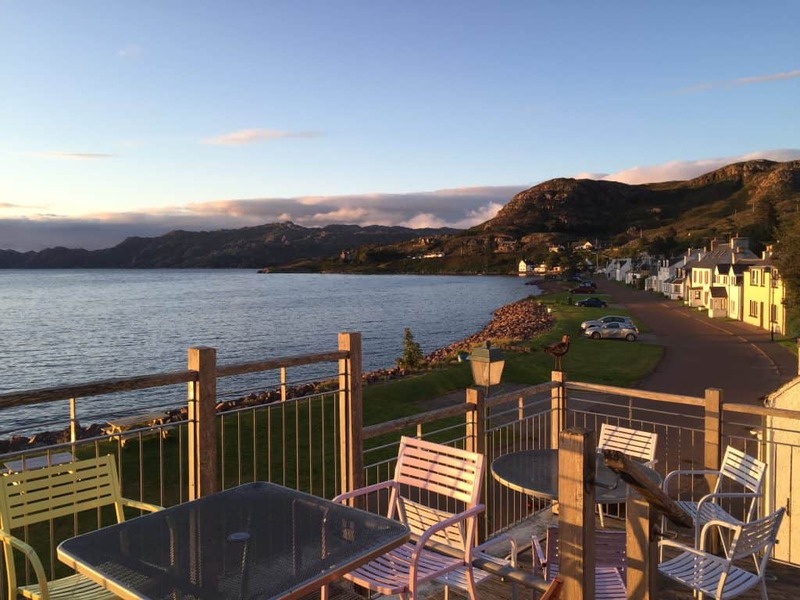 Mrs. MacDonald welcomed us with some tea and homemade shortbread, and we had a delightful and very filling breakfast the next morning while watching the sun rise. 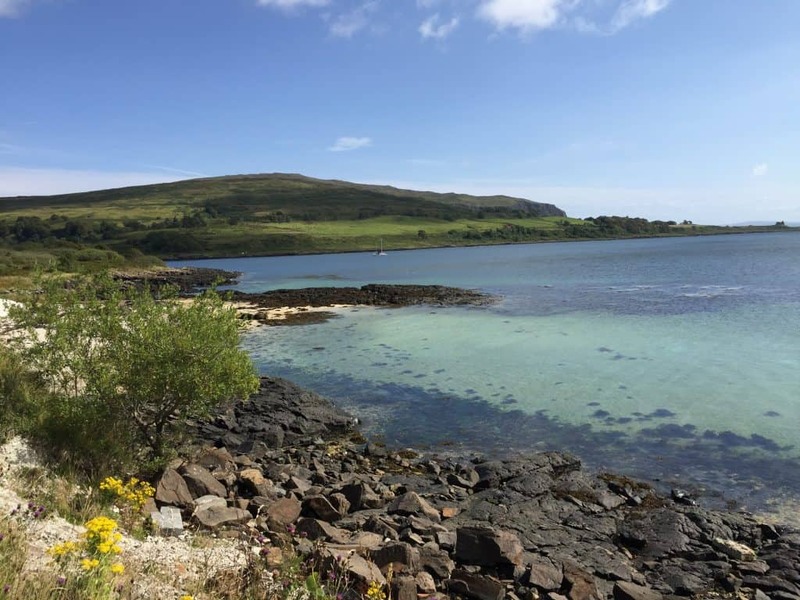 For this leg of the trip we stayed at Coille Challtainn in Isleorsnay, down on the south part of Skye. Not only was it close to our boat trip, but it made taking the ferry back to the mainland the next morning super easy. 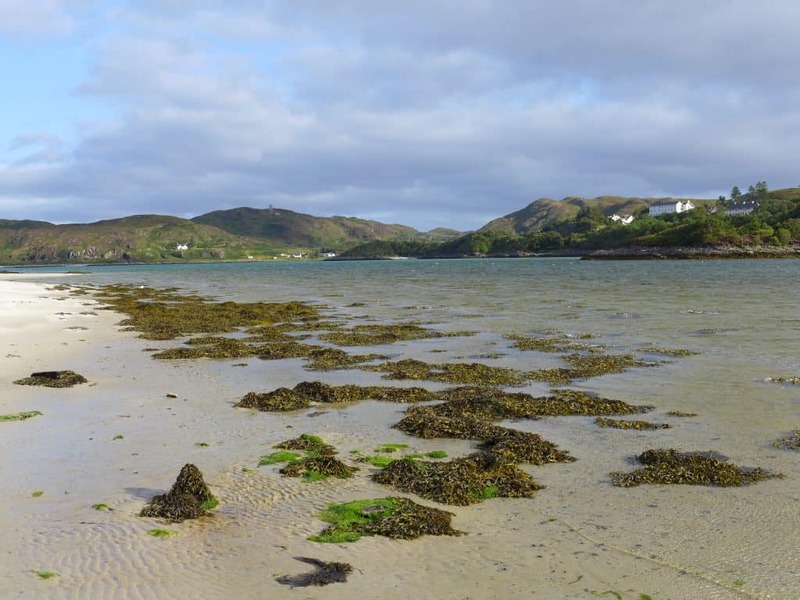 If you stay here, make sure you walk down to the local pub in Eilean Iarmain and have dinner or a pint! 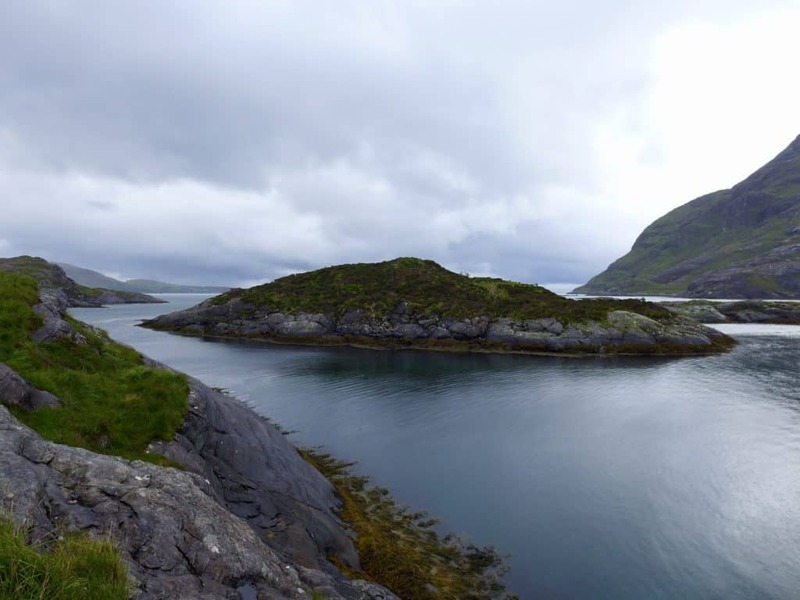 The next morning we took the early ferry over from Armadale to Mallaig, on the mainland. 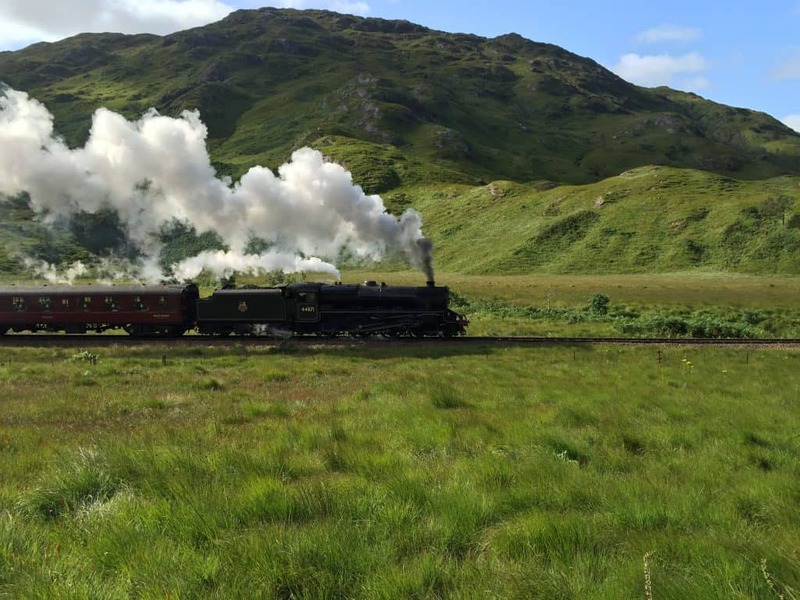 Our eventual desintation was the Isle of Iona, but we took our time heading down to the Glenfinnan Viaduct and through Glen Coe on our way. This is a travel and repositioning day, but a gorgeous one. 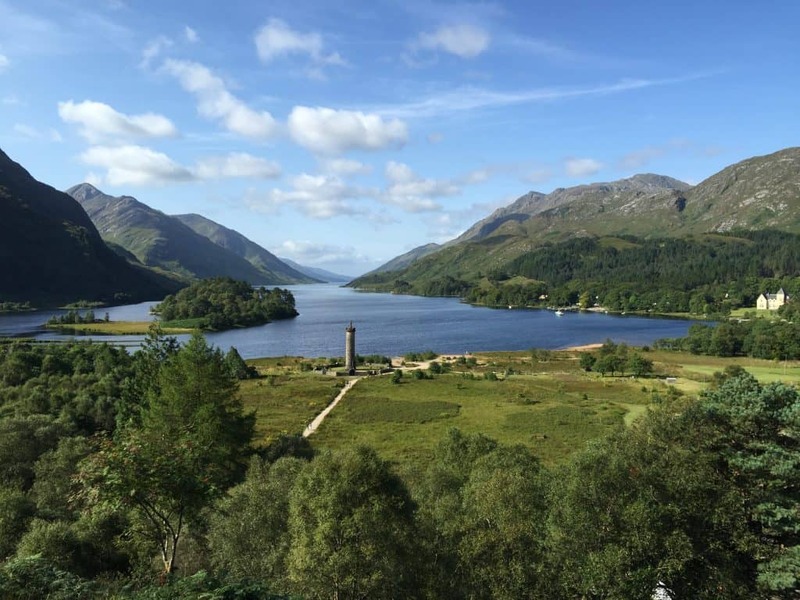 Why Glenfinnan, you ask?? Duh, to see the Hogwarts Express!!! 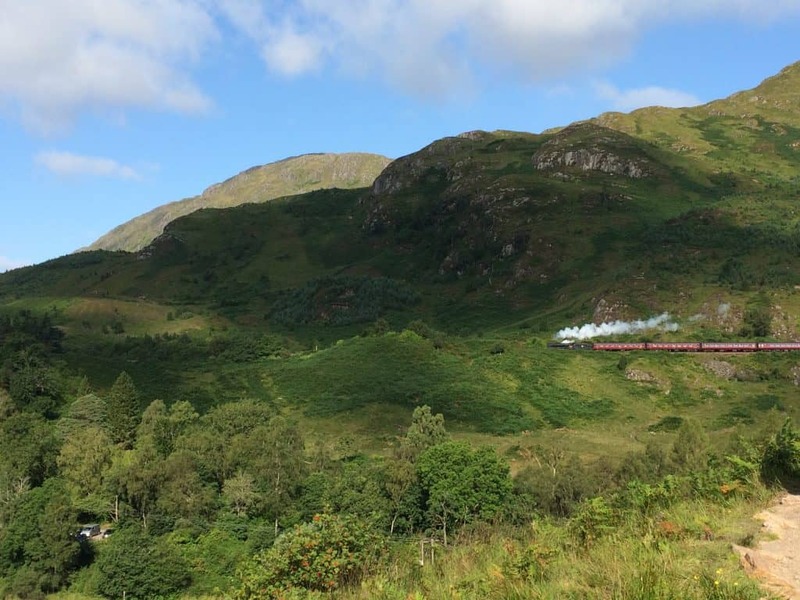 The Jacobite, a bright red steam train that takes tourists on a scenic ride through parts of Scotland, is known to Harry Potter fans as the famous wizard Hogwarts Express, and you KNOW it was on my must-list when I booked my trip. 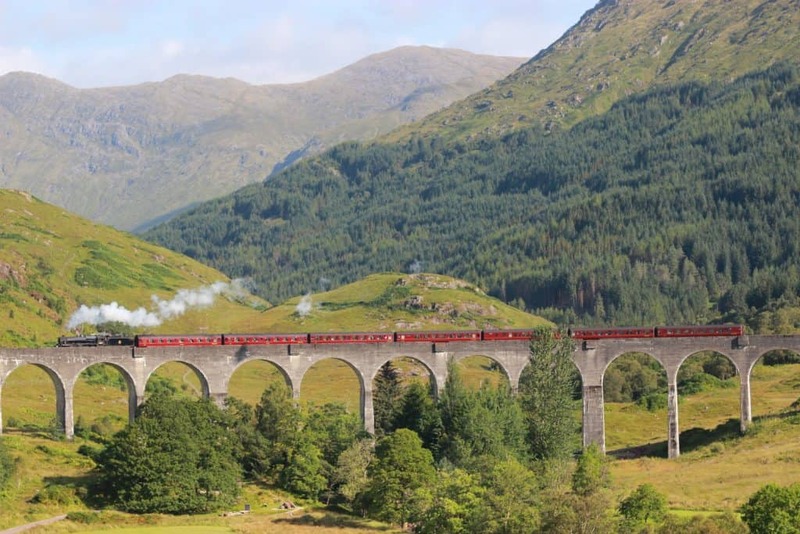 You need to look up the schedule ahead of time to find out when it will pass over the famous Glenfinnan Viaduct (like in this scene), and then stake out a spot and enjoy its white cloud belching, chug-a-chug-a journey over the bridge. I wish we’d had time to go up close to the viaduct as well, and grab some photos—it’s way more massive than it looks! 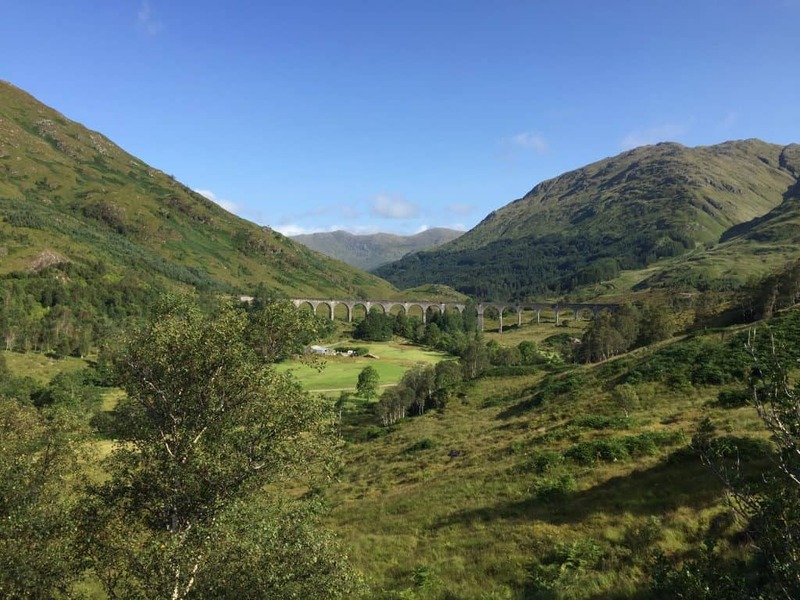 Speaking of Harry Potter…if you’re up there taking in the view of the Jacobite Train on the Glenfinnan Viaduct, TURN AROUND. Yep, this view should look kind of familiar too if you’re a fan. 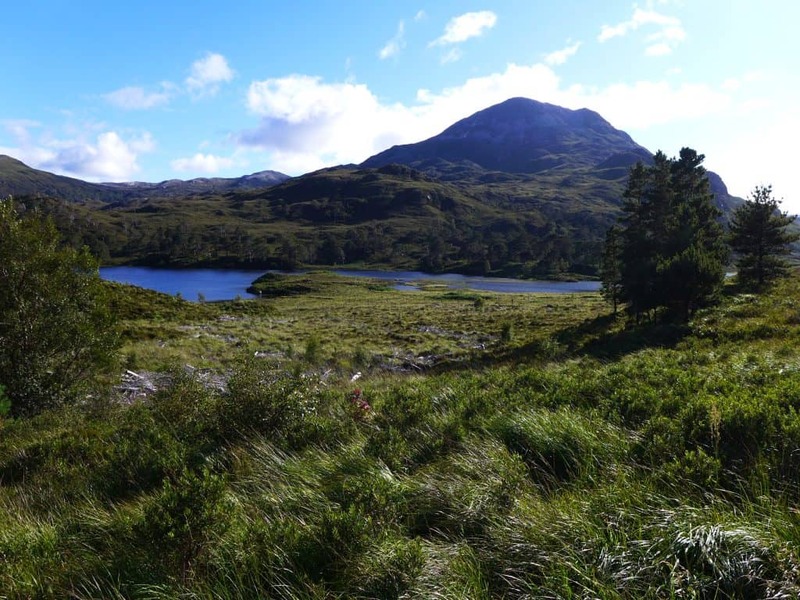 You’re looking at Loch Shiel, a piece of Glen Coe that was also used in filming some of the Harry Potter movies. 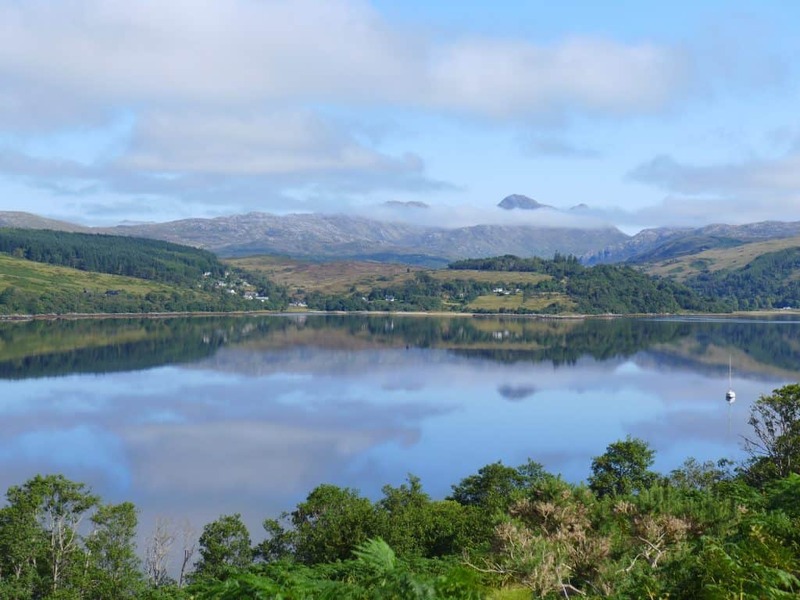 In fact, it’s one of the two lochs used for filming the movies over the course of the series (you can read more about this and other locations here). There are quite a lot of (gorgeous, scenic) places in this area that were used in filming. 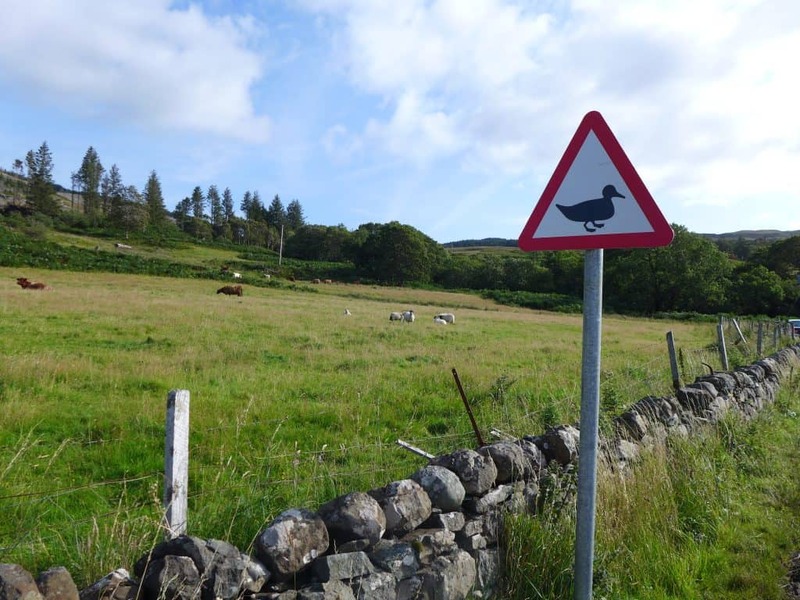 After leaving this area, we headed along a super windy road and finally got to Lochaline, then took the ferry over to Fishnish, on the Isle of Mull. 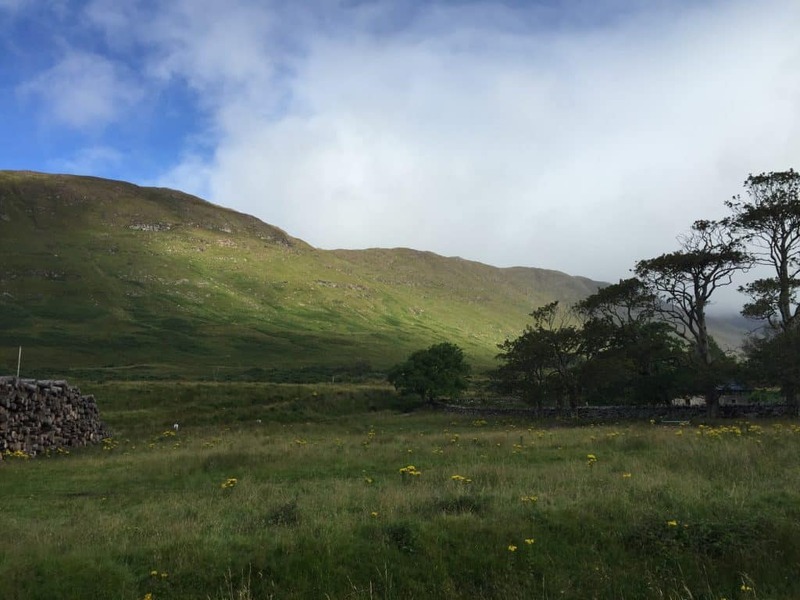 I’ll give a little shoutout to Mull as well…we didn’t get to spend any time there, just crossed the island to get over to the Iona ferry, but it is so pretty and charming. If you have time to explore, I recommend spending a day there! The sea drive is gorgeous, we took the (sloooooow) scenic route around and enjoyed ourselves. They have all these different animal crossing signs in different places, ranging from ducks to otters—I wish I’d gotten pictures of them all! 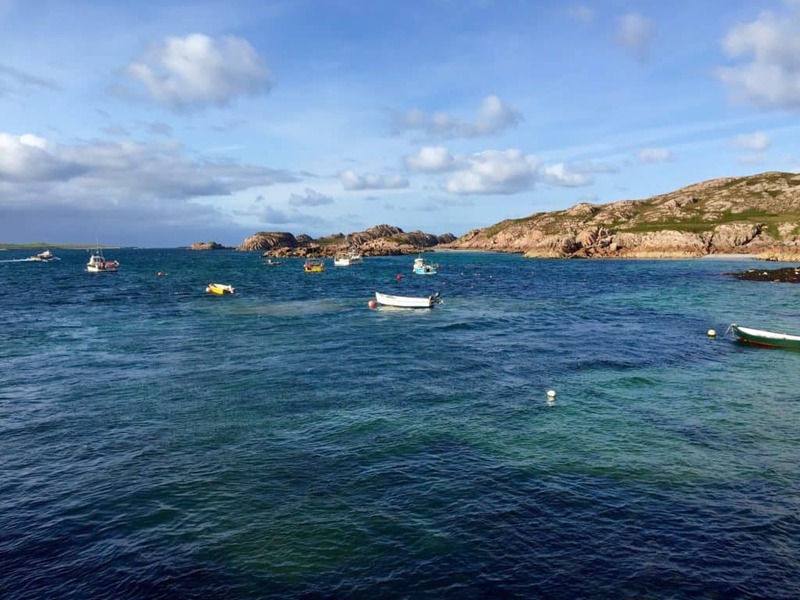 The wait for the ferry in Fionnphort was scenic in itself, with the area’s famous pink rocks against the bright blue water. 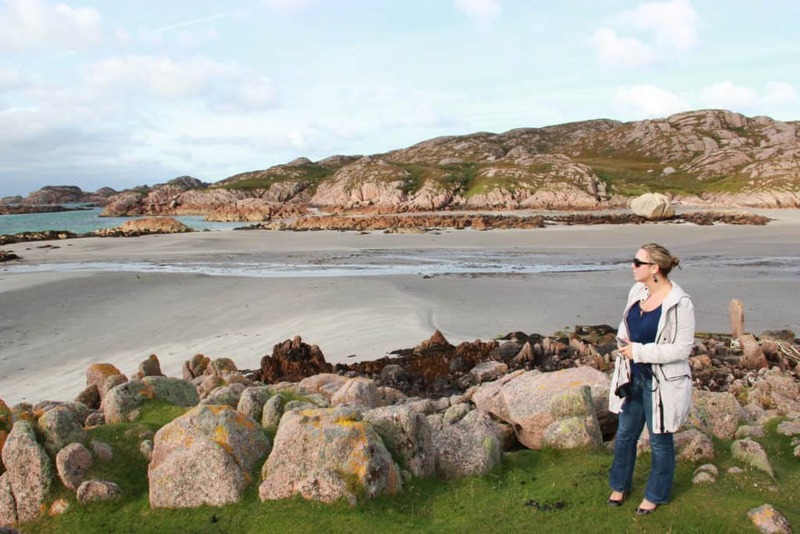 They don’t allow you to take your car over to Iona, so we just grabbed our luggage and took the ferry on foot over to Iona for probably our favorite two days of the entire trip! These two days were absolutely magical! 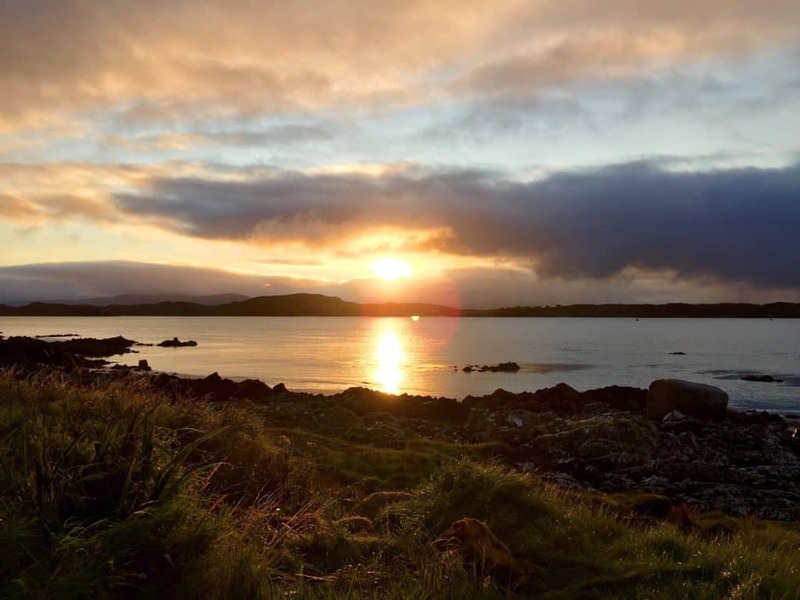 I totally fell in love with Iona’s peace and quiet. It helped that we had a three-day stretch of picture-perfect weather, which really helped us be able to soak in the serene beauty and history of the island. 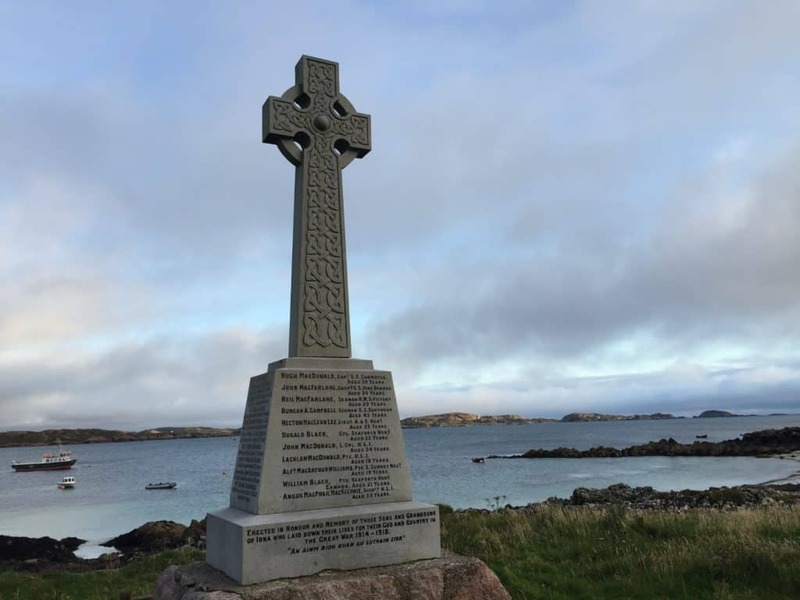 Despite its tiny size, Iona is pretty famous in the religious history of Scotland. 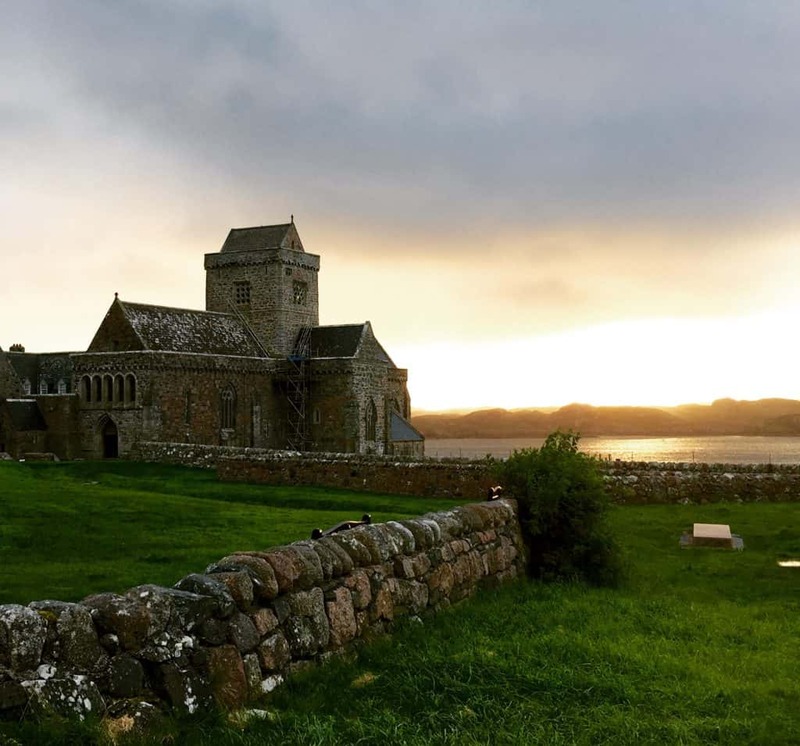 The now-restored abbey pictured below was founded in 563 AD by St. Columba, and was a center for the spread of Christianity in Scotland among the Picts and Scots. 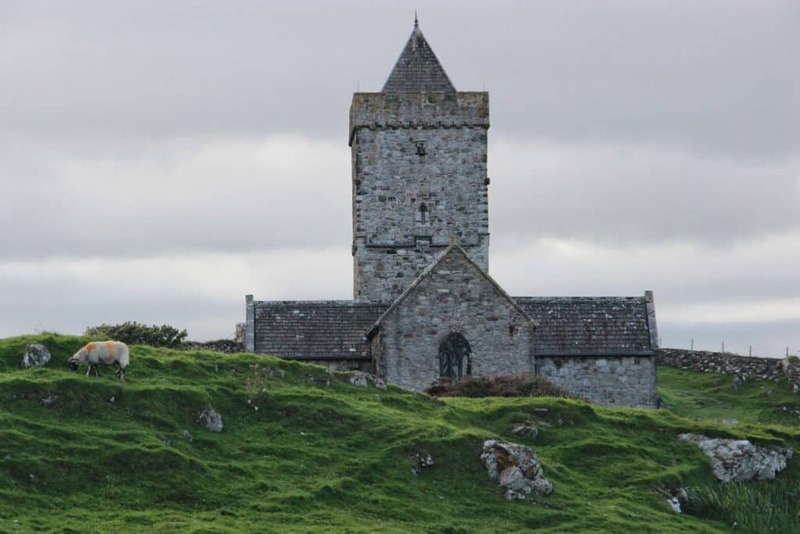 Over the centuries, the monastery weathered multiple Viking attacks, and the island was even controlled by the King of Norway for about 50 years (I mean…WUT). 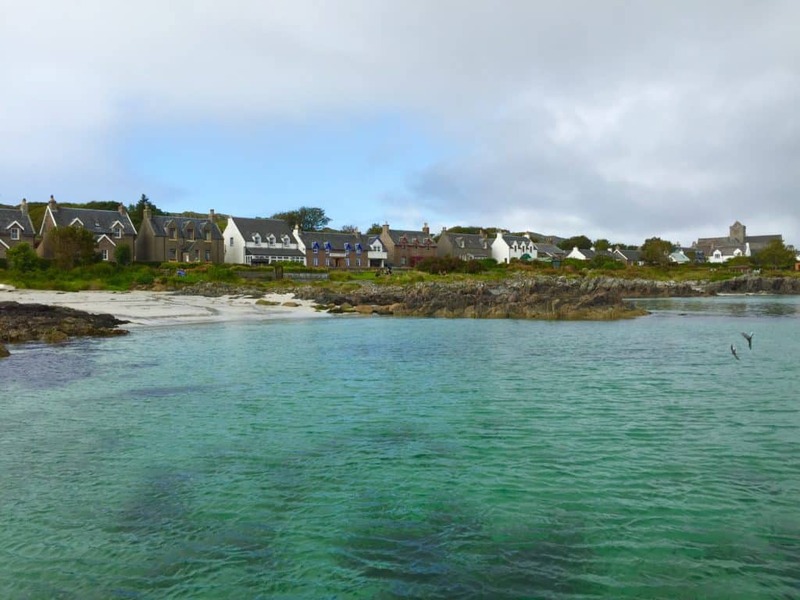 Read more about how to visit the Isle of Iona here! 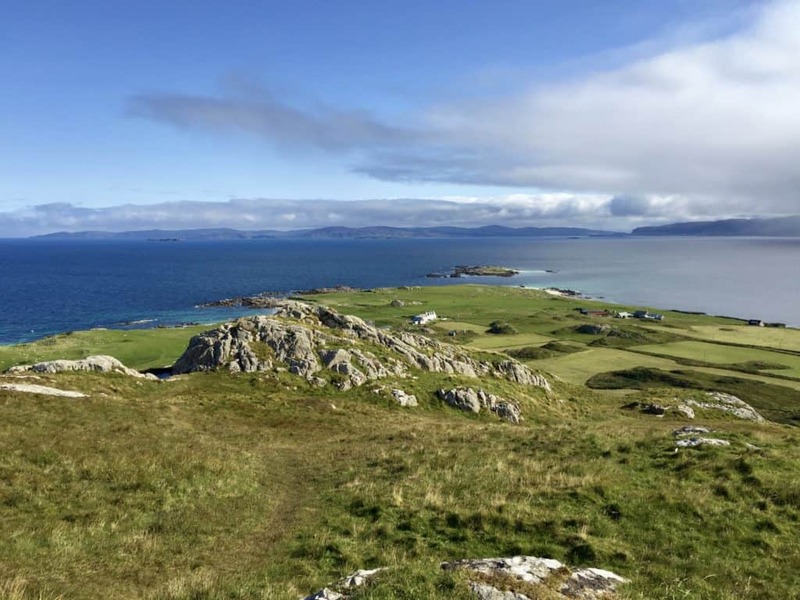 Besides exploring the abbey and nunnery ruins, one of the other things to do on Iona is to climb Dun I (“dun-eee”), an Iron Age hill fort. We had beautiful weather for the hike, and the view from the top is completely worth it, if the visibility is nice! 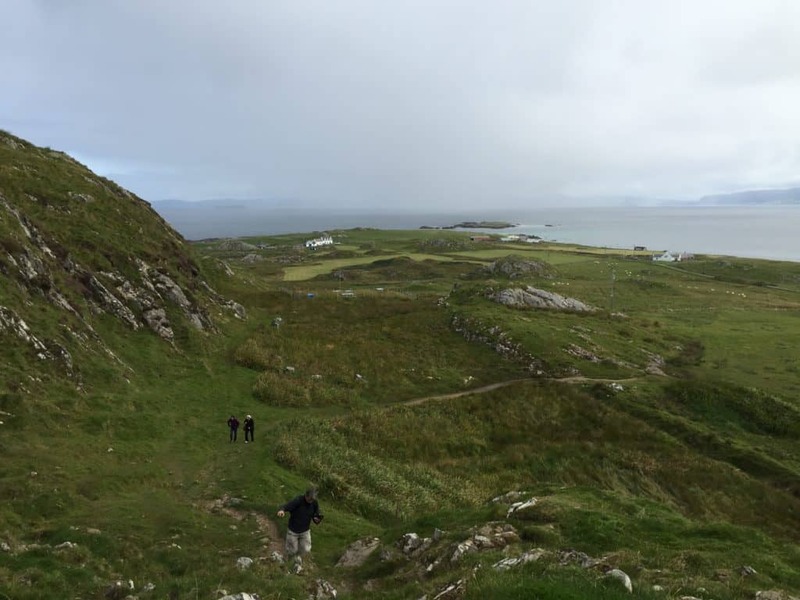 You also should just wander around the island—it’s only a little over 3 square miles! That means you can walk side to side in almost no time. I wish we’d had more time to walk all the way around, particularly the beaches on the northern end. 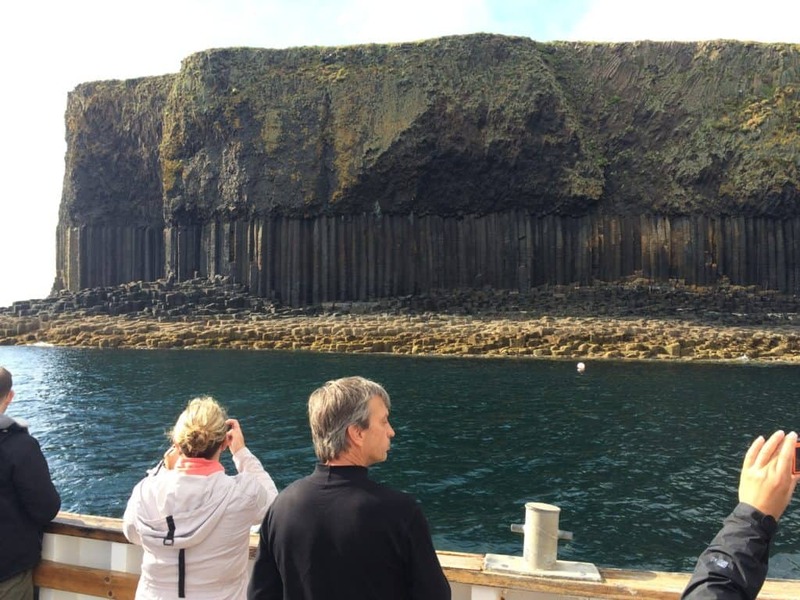 But alas, we didn’t have the time because we had something else super special to do—a boat trip to the famous Isle of Staffa! 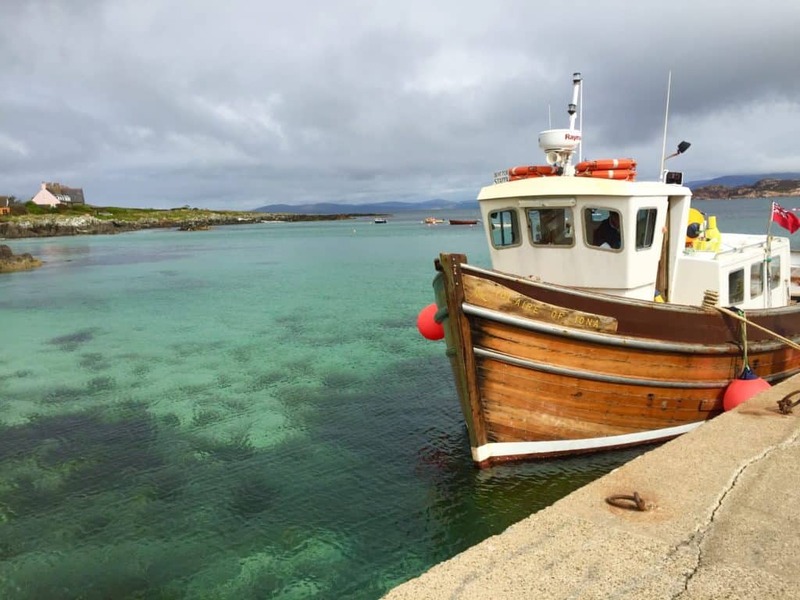 We boarded the Iolaire of Iona and headed out to sea. 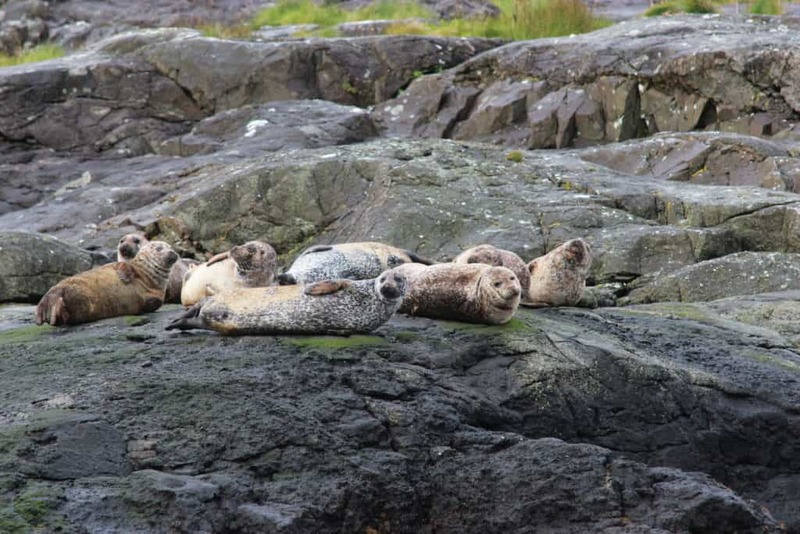 Along the way we got to see some absolutely adorable chubby seals basking in the sun. 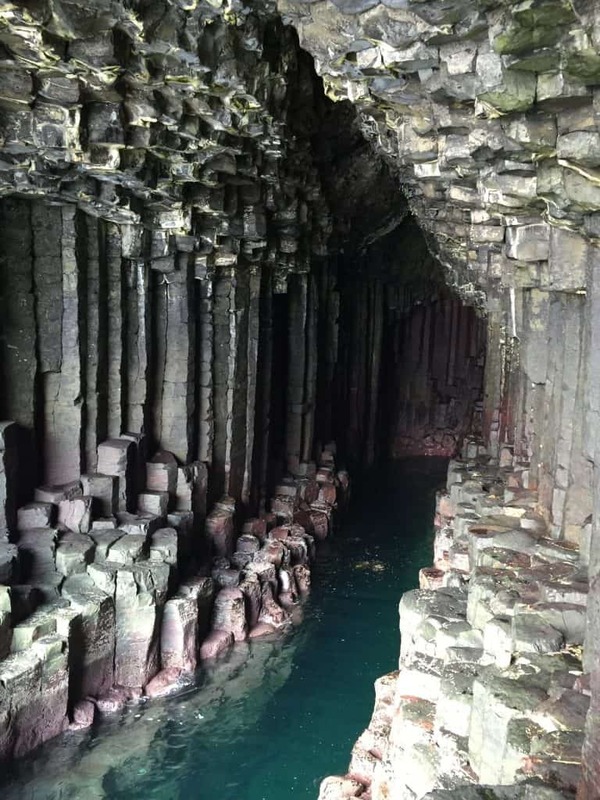 Staffa is a tiny little uninhabited island famous for its natural hexagonal rock formations and being the home of the Cave of Melodies. Once the boat docked, most people headed for the Cave of Melodies, so my parents and I instead climbed up onto the top of the island to appreciate the view. 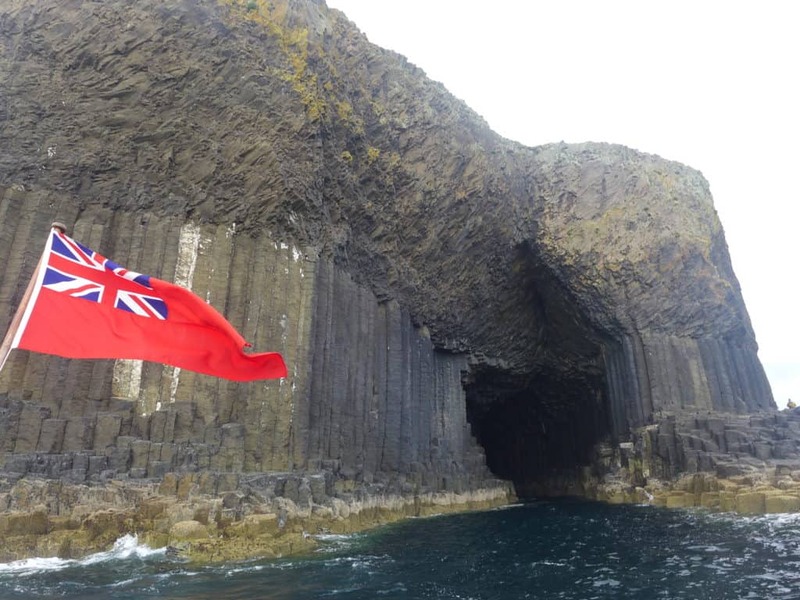 Read more about visiting the Isle of Staffa here! 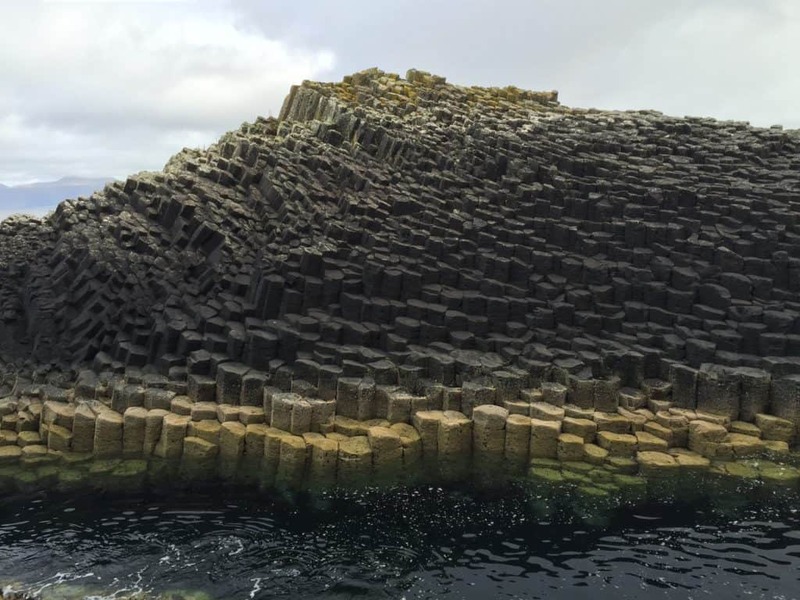 I was completely obsessed with the way the hexagonal basalt columns rose and fell to make different shapes. They were mesmerizing. Once everyone else had lost interest, we made our way over to the Cave of Melodies, or Fingal’s Cave. It’s kind of tough to get a good picture of, but it’s really pretty and famous for its gorgeous acoustics. 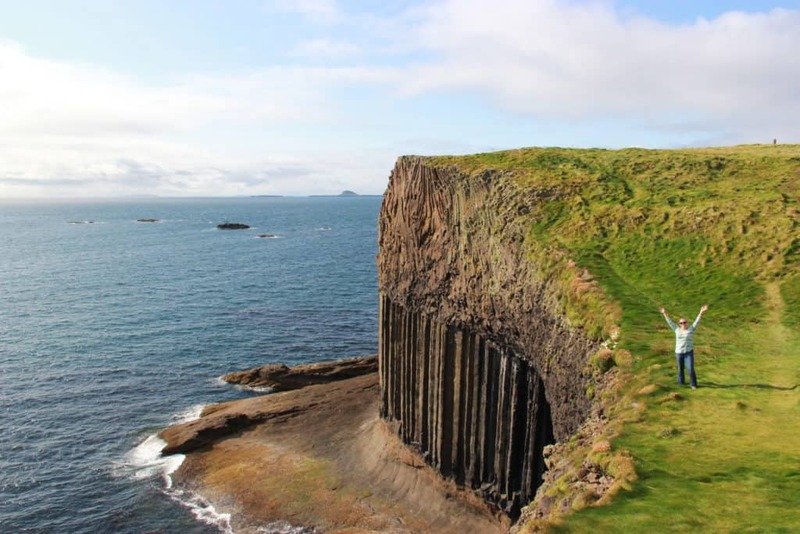 Mendelssohn wrote his “Hebrides Overture” after visiting the cave and hearing how the water and air reacted with the unique structure (hence the “Cave of Melodies”). My parents, grandma, and I sang some harmonies to see how the sound would echo and amplify—it was amazing! 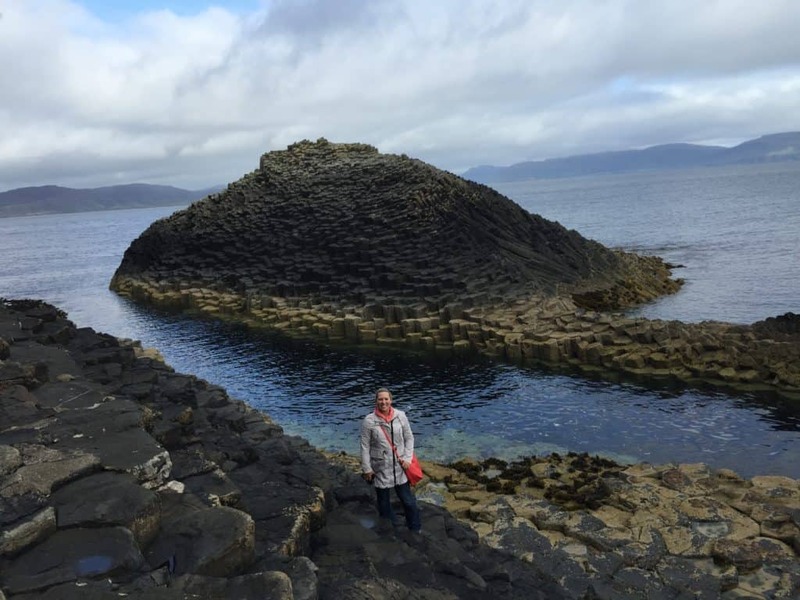 Needless to say, if you’re over in that area, I *highly* recommend doing a trip out to the Isle of Staffa! 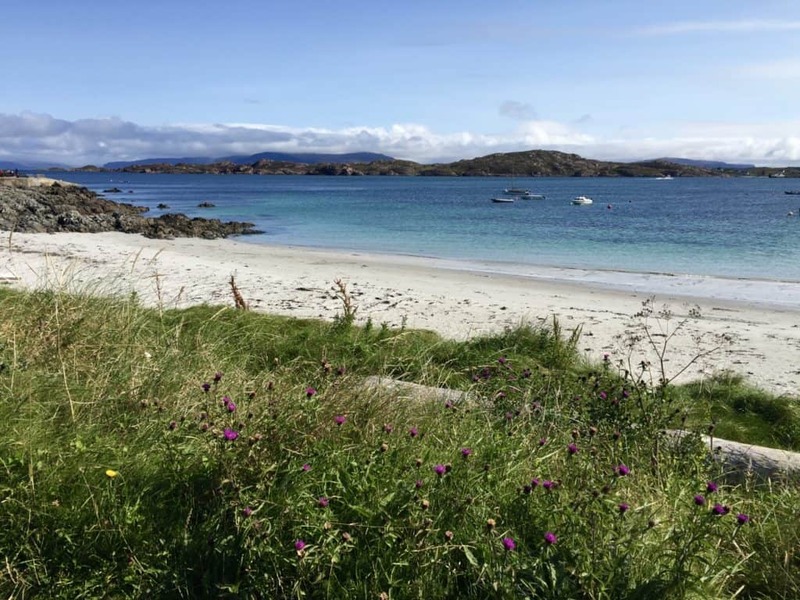 We stayed at Torrasa B&B on Iona with Sara and Graham’s family and it was lovely, highly recommend. After about a day and a half on Iona, we took the ferry back over to Mull, picked up our car, and headed back toward the mainland. 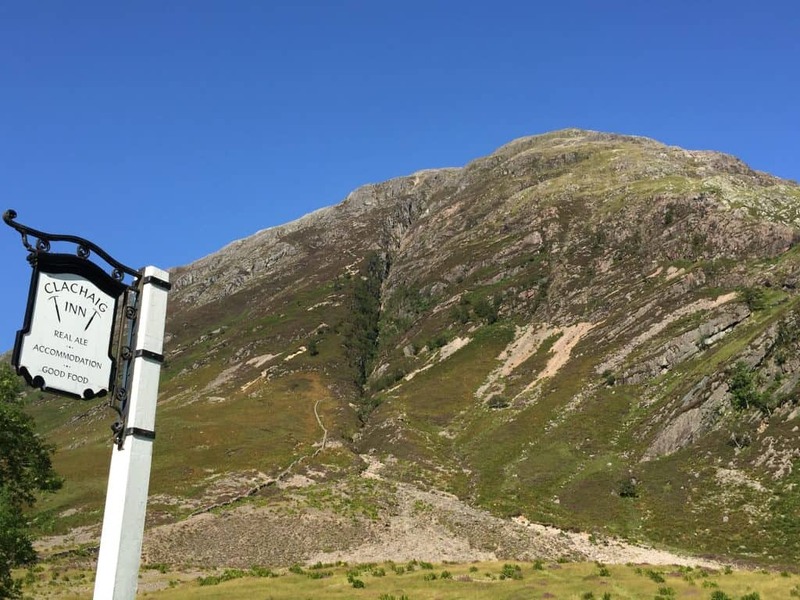 Along the way we drove through Glen Coe and enjoyed the scenery, with a stop at the Clachaig Inn for lunch. Our final destination was Edinburgh, where we dropped off our car at the airport and took a cab into the city to enjoy our last day on foot. 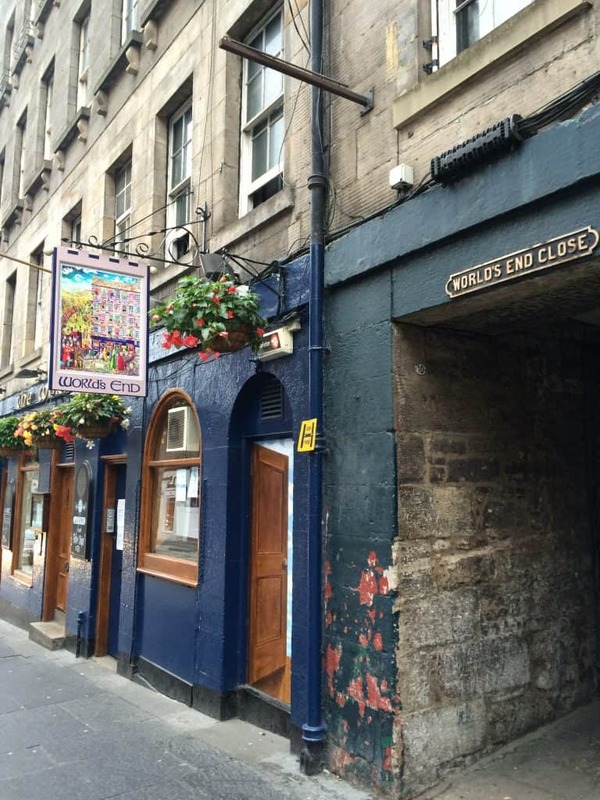 Edinburgh really is charming, one of those cities that is all about little details and quirks. It’s also very walkable, which I appreciate. Sadly the weather continued to be a Gloomy Gus, but we enjoyed ourselves nonetheless. 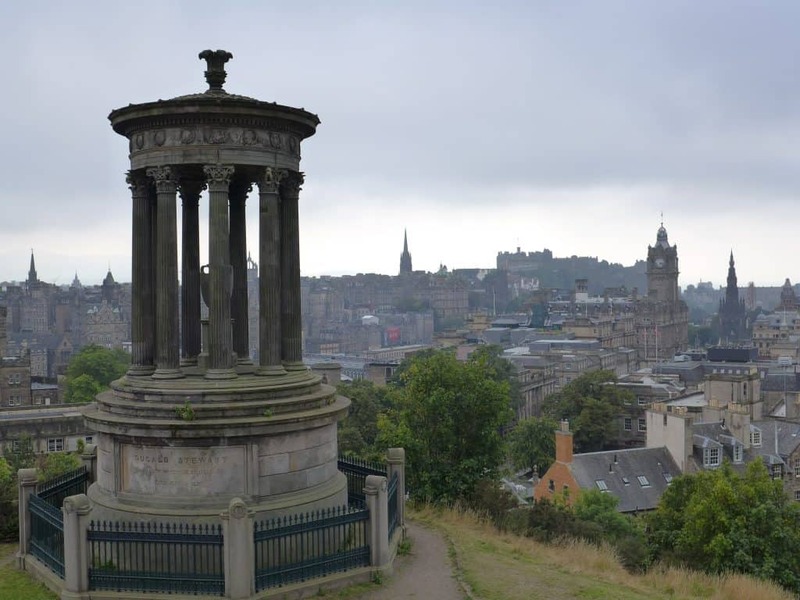 Read tons more about what to do in Edinburgh & a great walking route here! 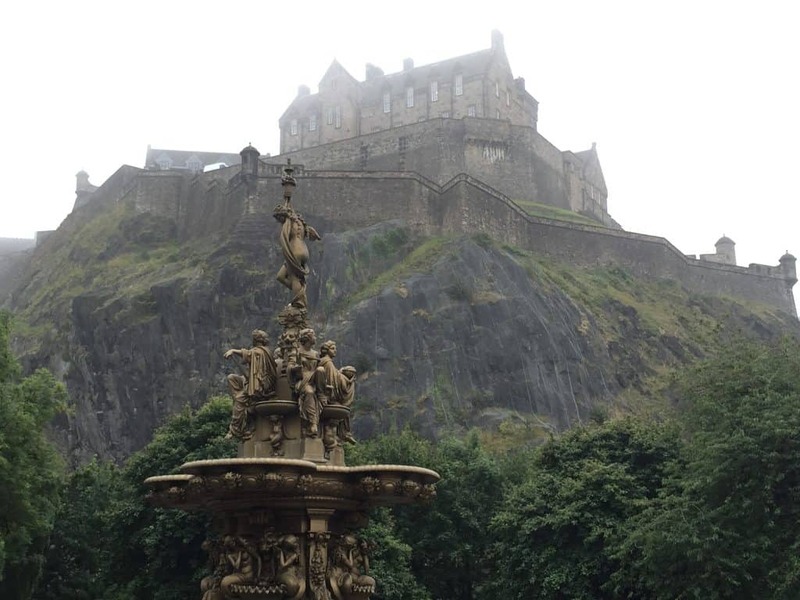 We loved the moody look of Edinburgh Castle from afar, but since it was pea soup fog everywhere we didn’t bother spending time up at the castle for the view. The pics we took from Princes Garden were pretty great though. 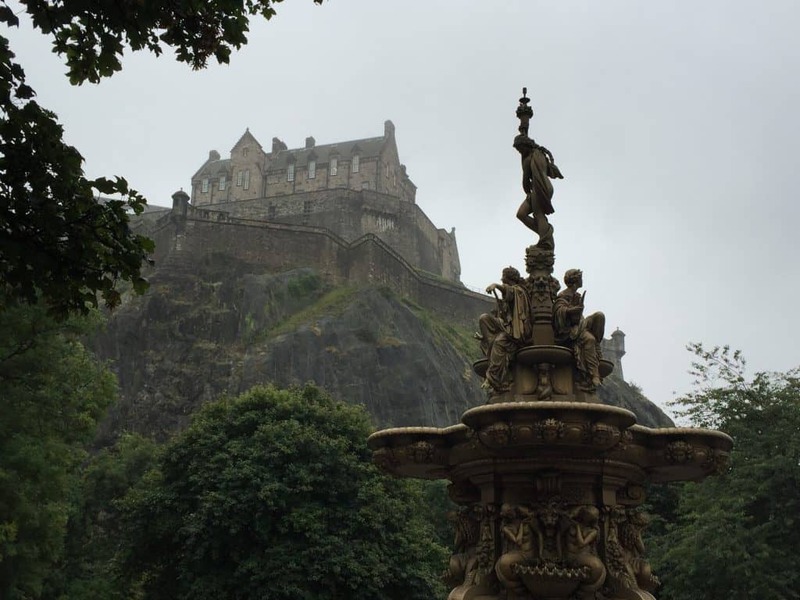 A lot of our time in Edinburgh was just walking (here’s a great route), soaking in the ambiance. 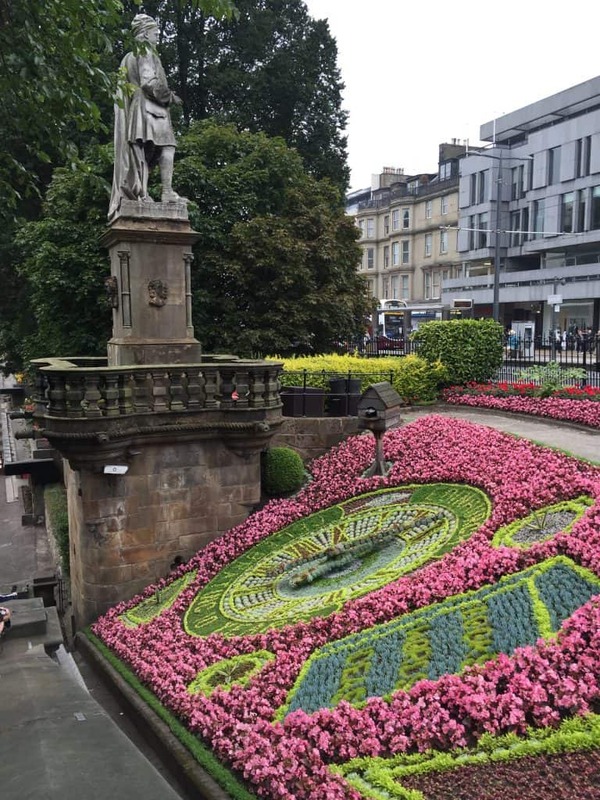 Read up on the Bonnie Prince’s story, enjoy the floral clock, sit and have tea and a scone at Clarinda’s, and pretend you’re royalty at Holyrood Palace. The weather cleared up a bit in the afternoon and we were able to enjoy a view of Arthur’s Seat as we climbed Calton Hill. 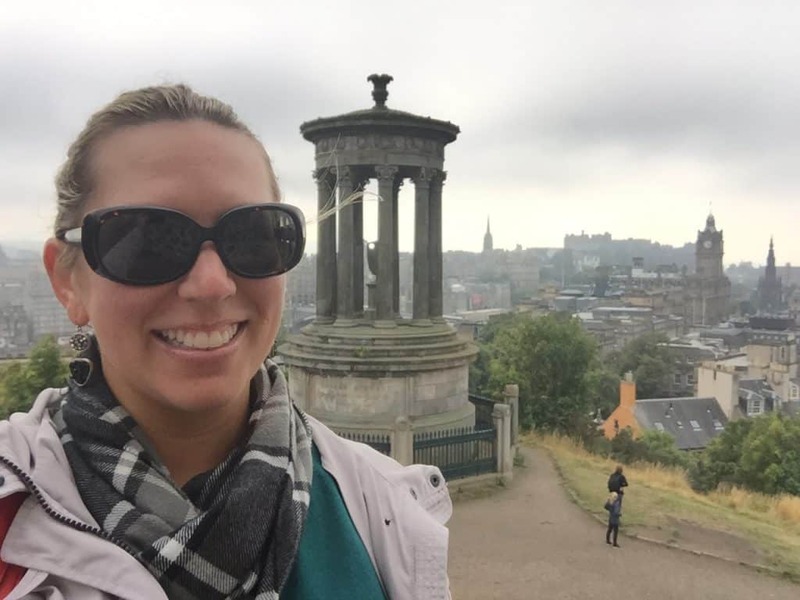 But that view doesn’t hold a candle to the view of Edinburgh from the top—if the weather permits, you definitely have to head up and enjoy the sunset up there! 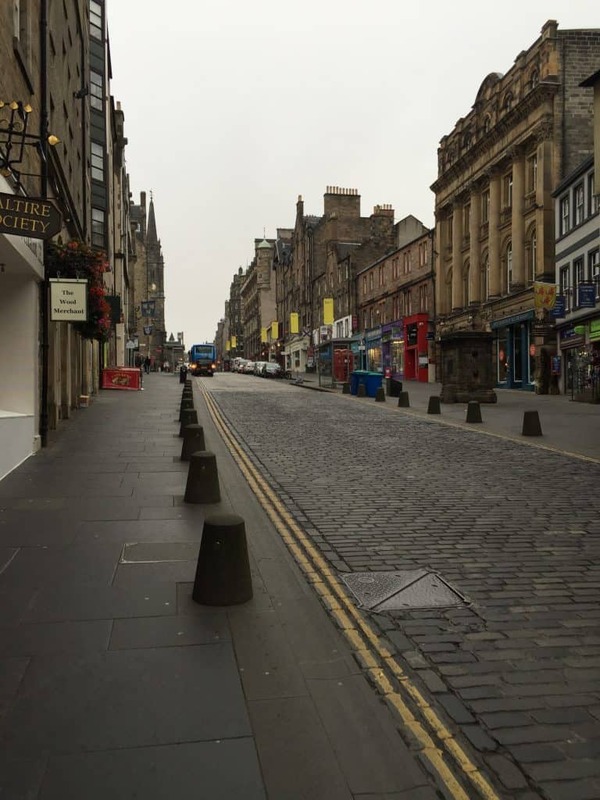 We stayed in a HomeAway apartment right at World’s End Close on the Royal Mile. The location was absolutely perfect! The biggest thing to know is that everything will take longer than you think! As you’re researching you’ll see a distance and think, “Wow, 30 km isn’t that much!” Technically, you may be right, but that 30 km might take you an hour—especially if you’re stopping off for photos, getting blocked by sheep, or get caught behind a slow vehicle. 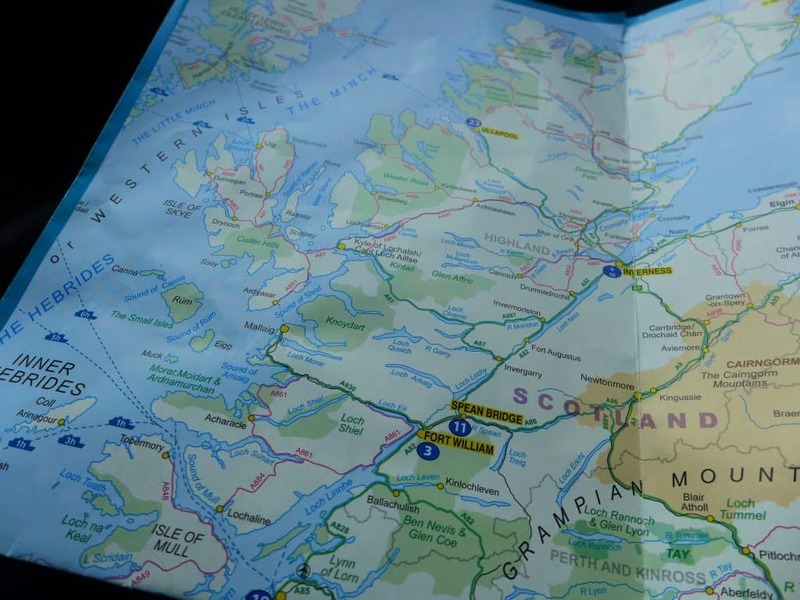 One tip that someone gave me years ago for international roadtrips is to use AA Route Planner to estimate driving times, and then probably add 25% onto whatever it says for places like northern Scotland and the islands. 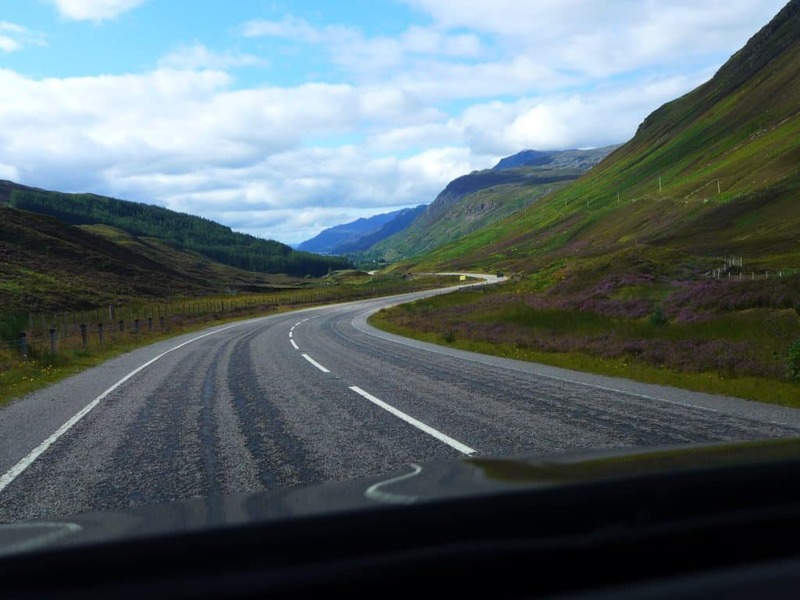 Scotland has plenty of really nice, well-maintained roads and highways, but just remember that you’re probably not used to driving on the left—you need to be careful! There still are some rough and dodgy roads in rural Scotland, but on the whole I felt the roads were much better than in Ireland. Also note, most rental cars are manual (stick shift), so if you need an automatic (I do) you’ll need to choose it intentionally and it’ll cost more. Honestly though, even for a skilled stick shift driver, getting an automatic removes one of the variables to figuring out how to drive on the left and staying focused. 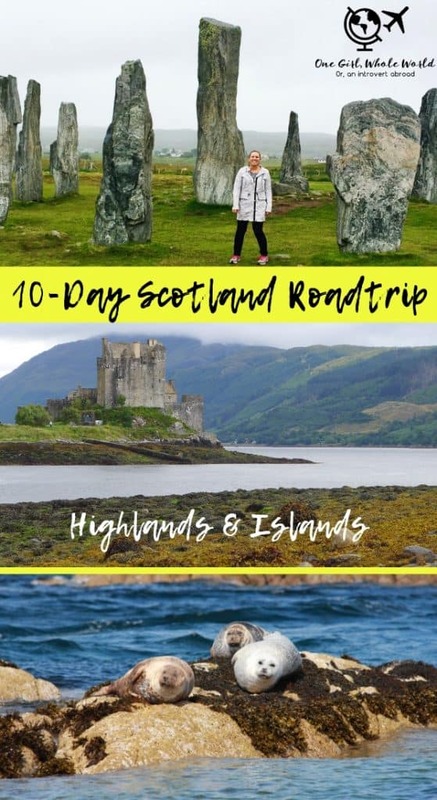 Hopefully this has given you a ton of inspiration and tips for building your own roadtrip for a 10-day Scotland itinerary…can you see why the “Highlands & islands” is the way to go?? If you have any questions as you’re building your own itinerary, hit me up in the comments!